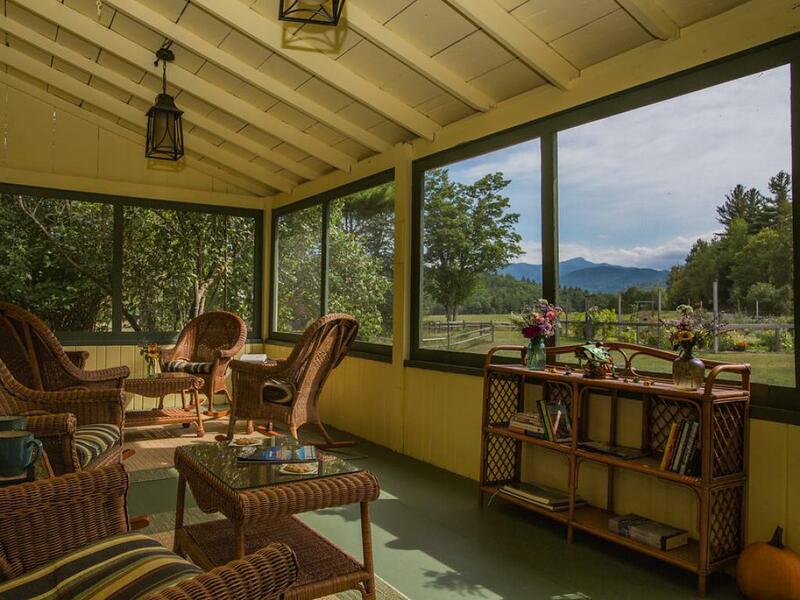 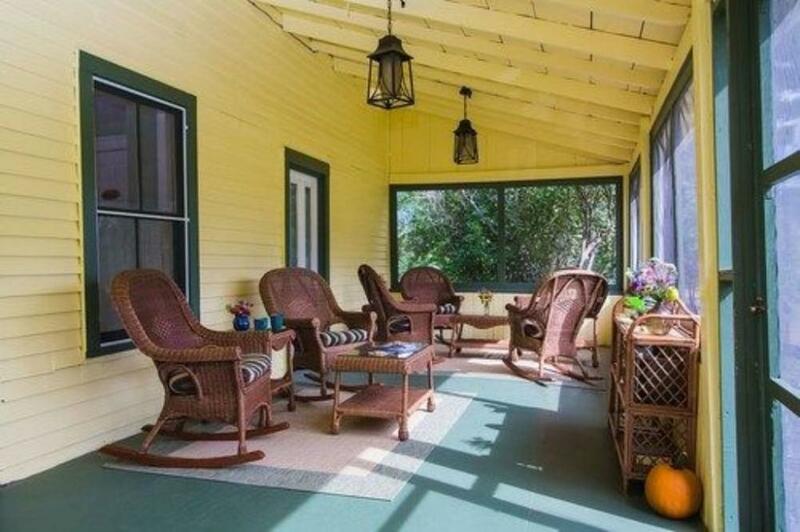 This newly renovated private 3 bedroom log cabin has a lovely view of Sentinel Mountain from the large back deck. 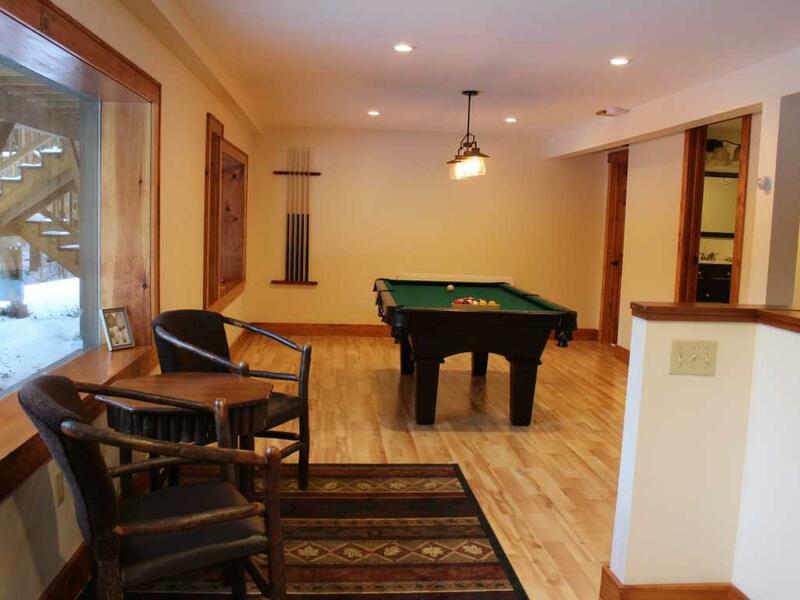 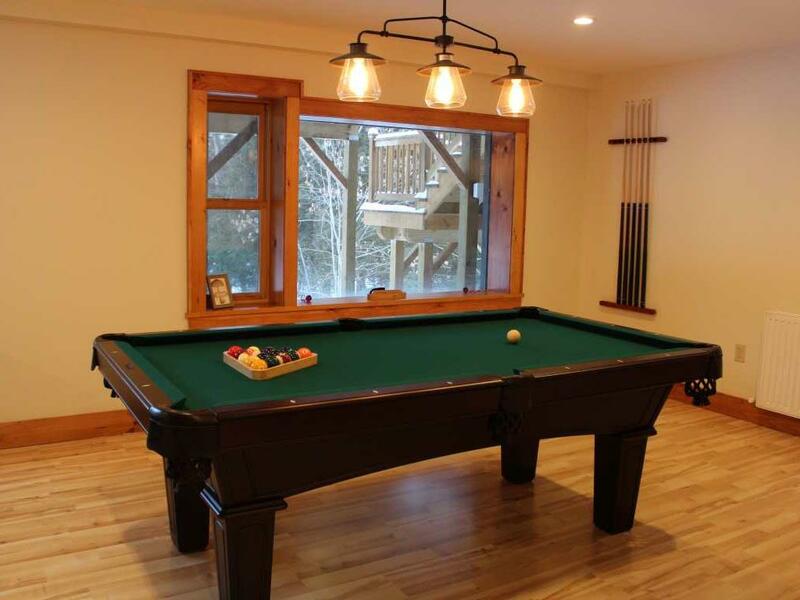 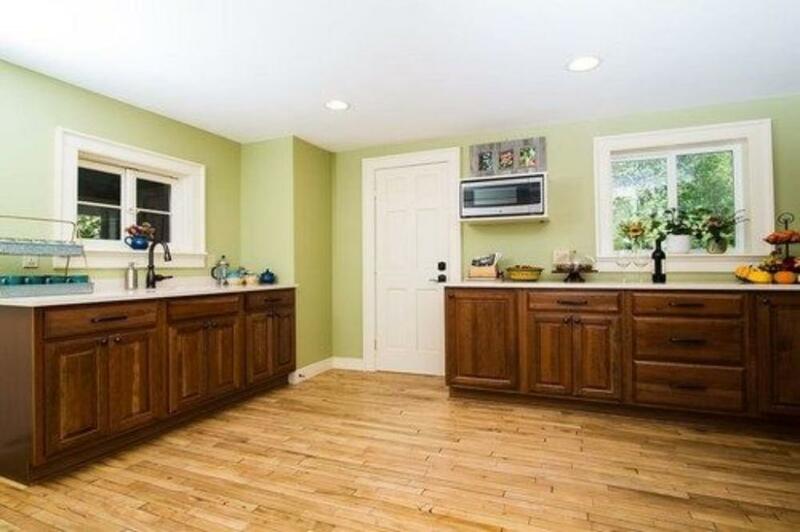 It is completely refinished with a modern and fully-equipped kitchen, and a game room lounge... great for a family or friends traveling together! 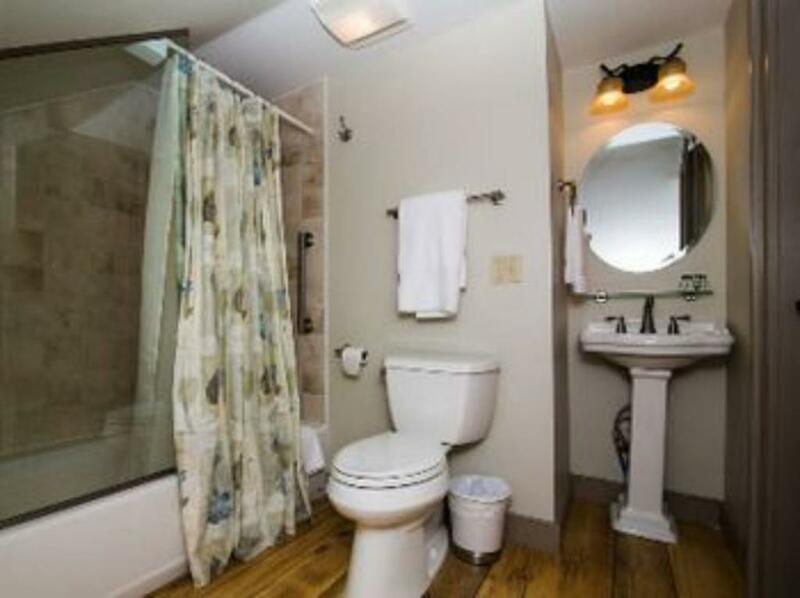 Interior pictures coming soon once we finalize the décor. 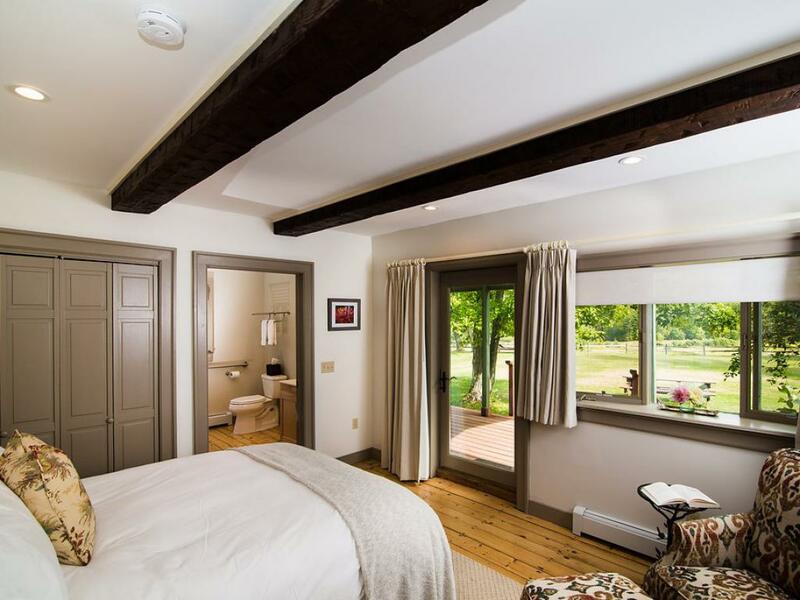 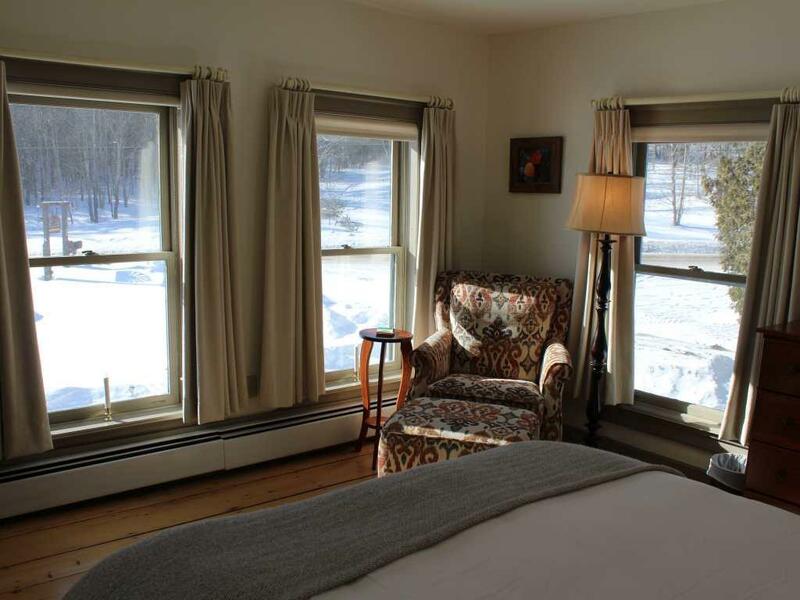 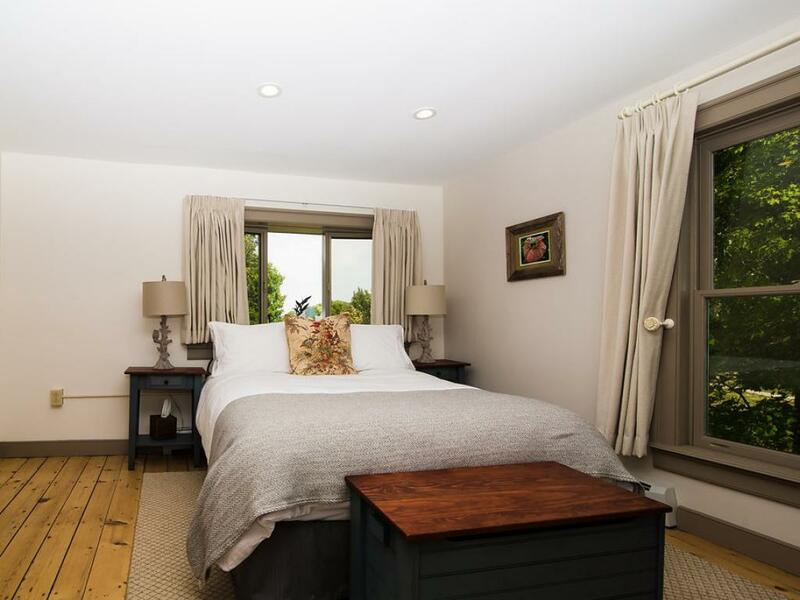 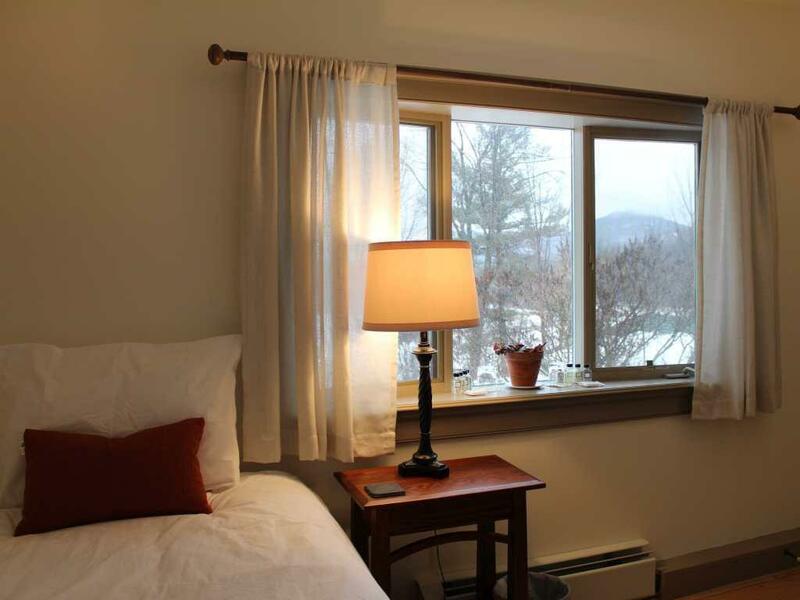 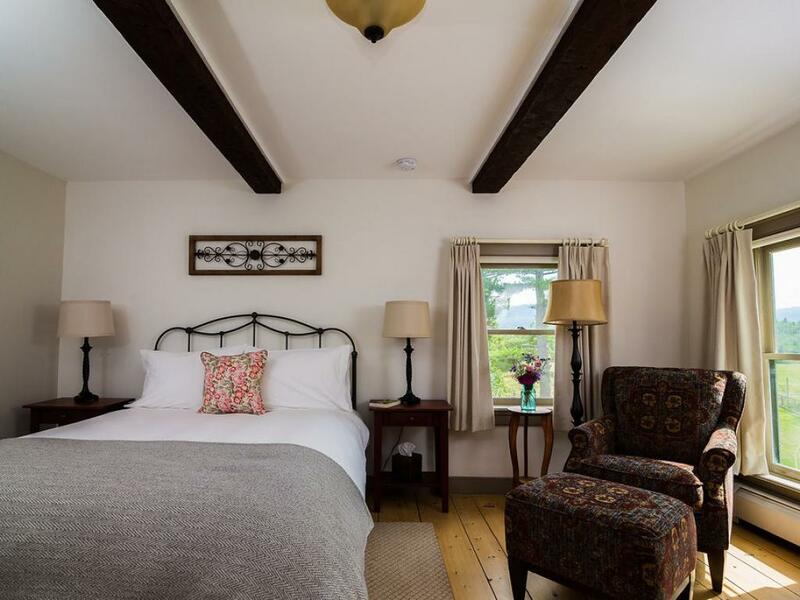 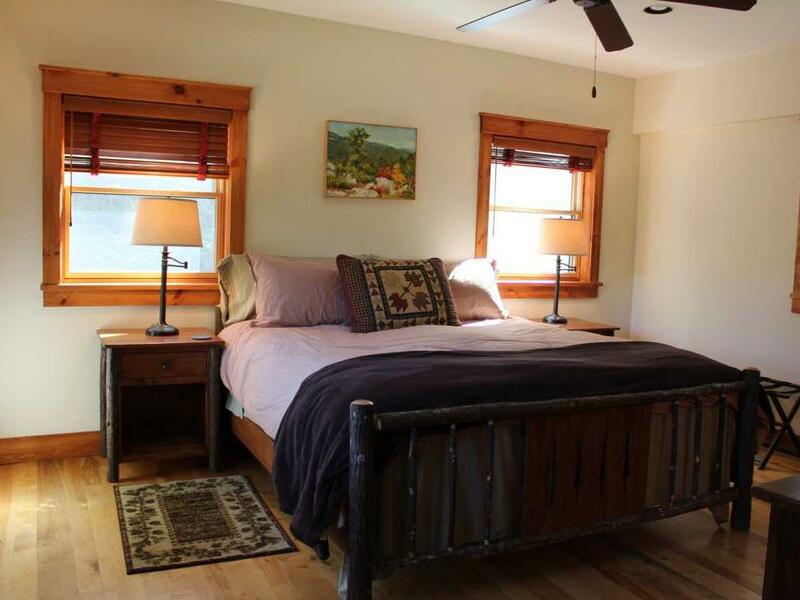 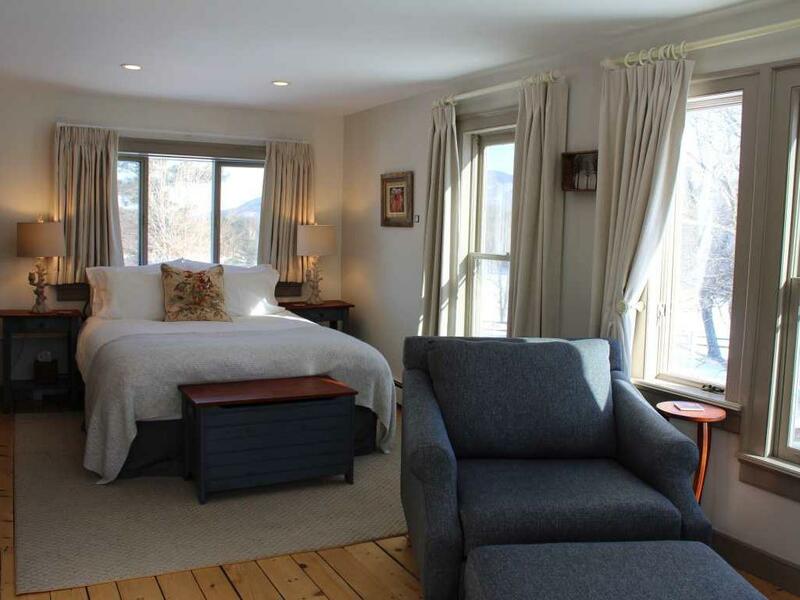 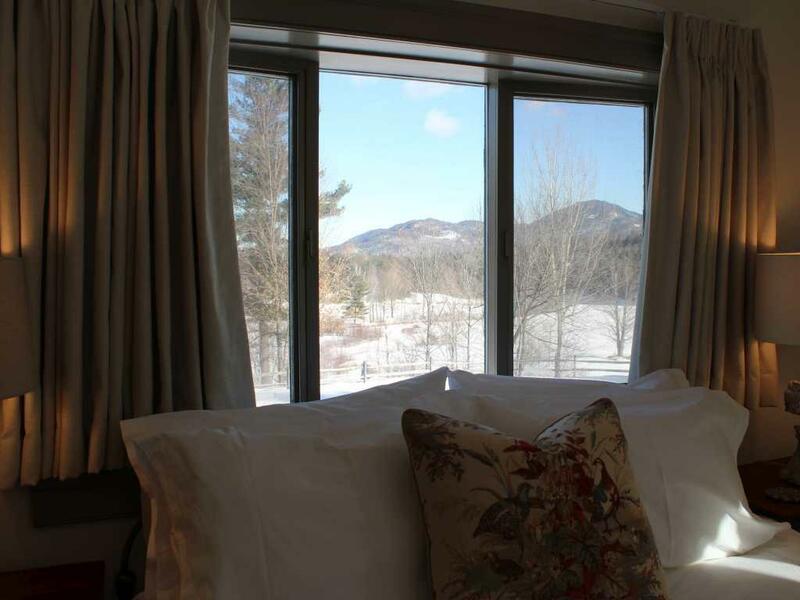 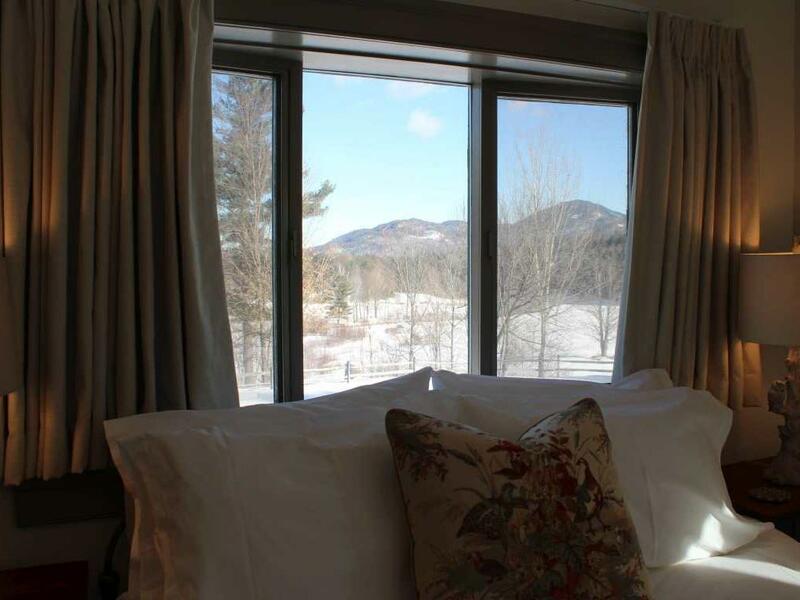 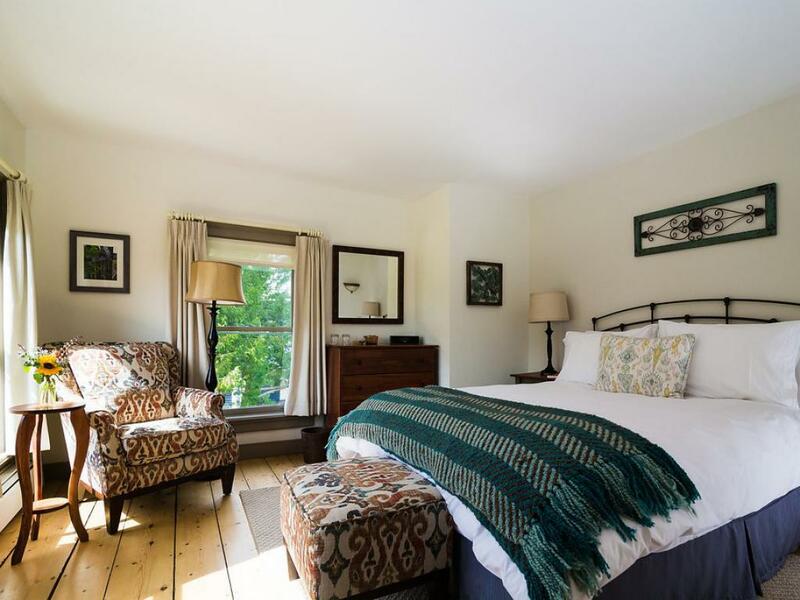 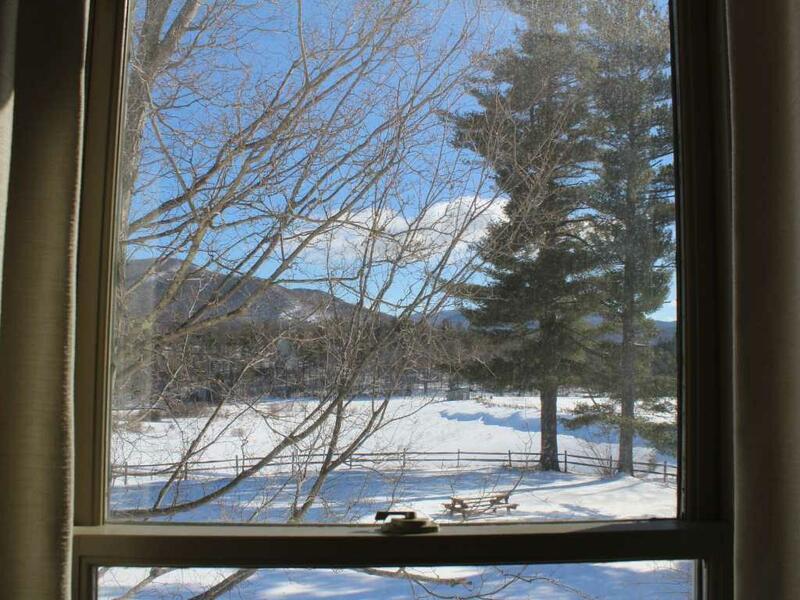 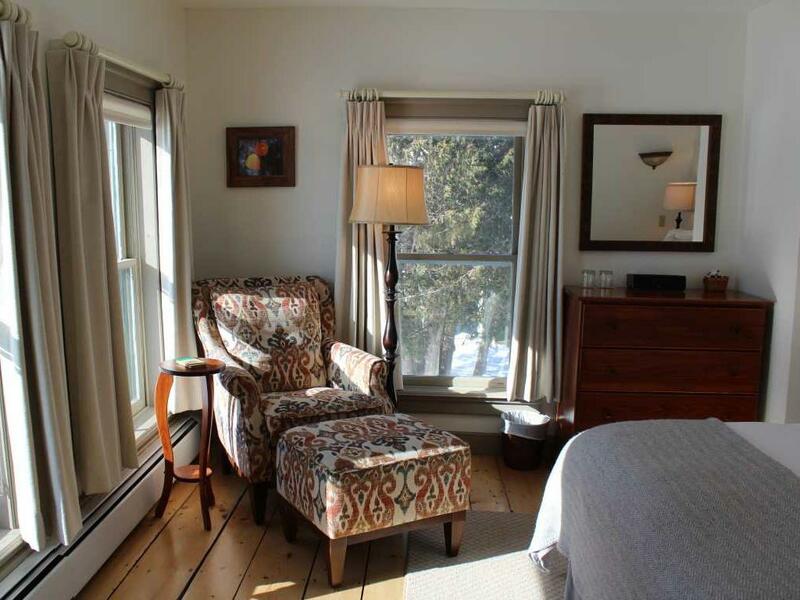 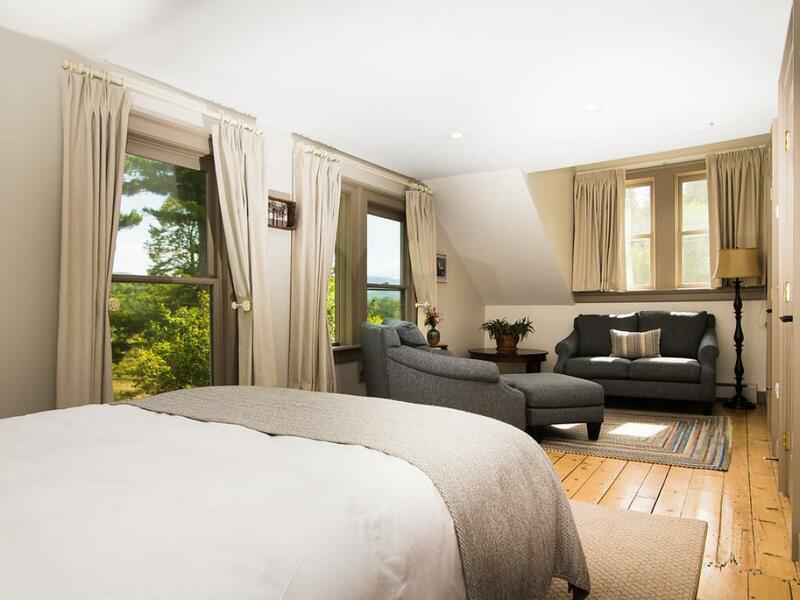 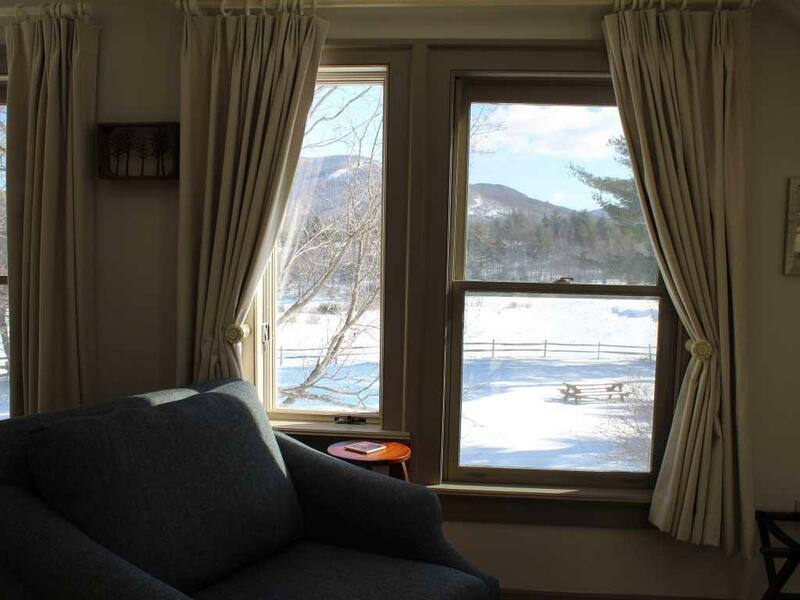 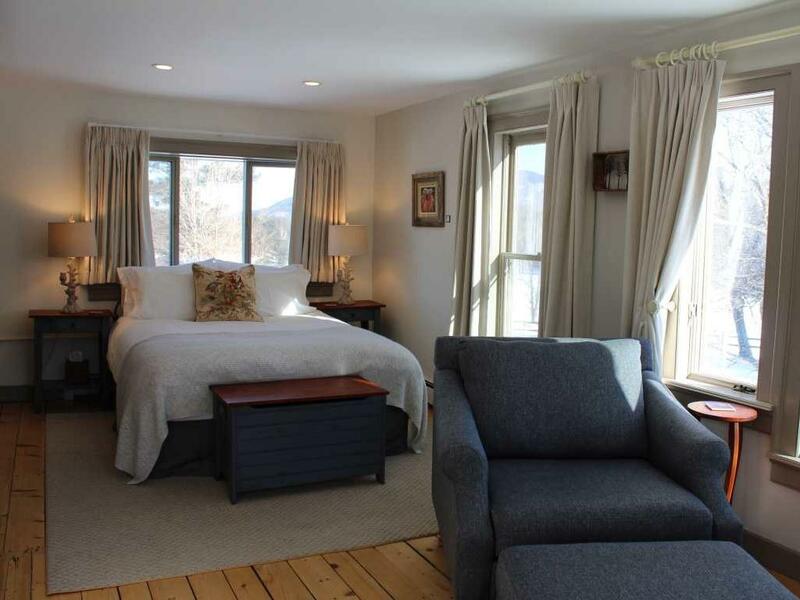 Our largest room, this second floor guest room has six windows, offering exquisite views of the Bark Eater meadows and mountains making the room beautifully bright. 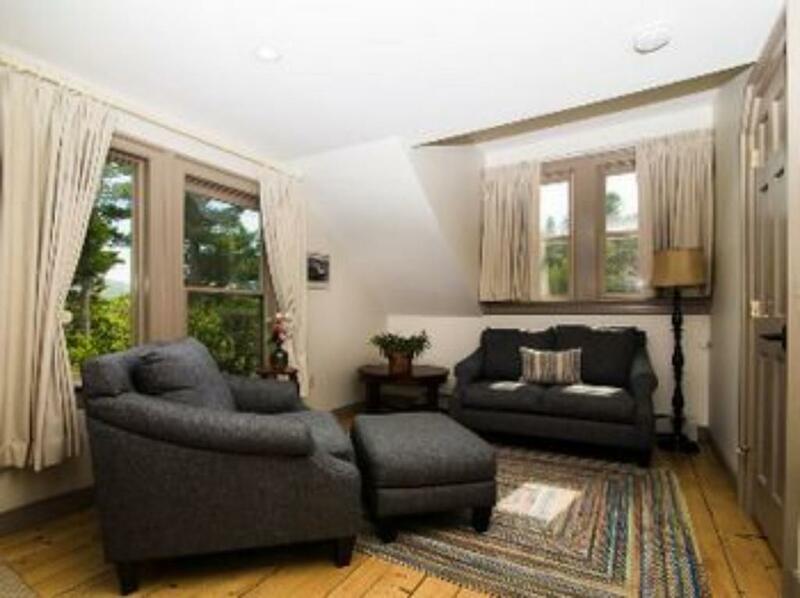 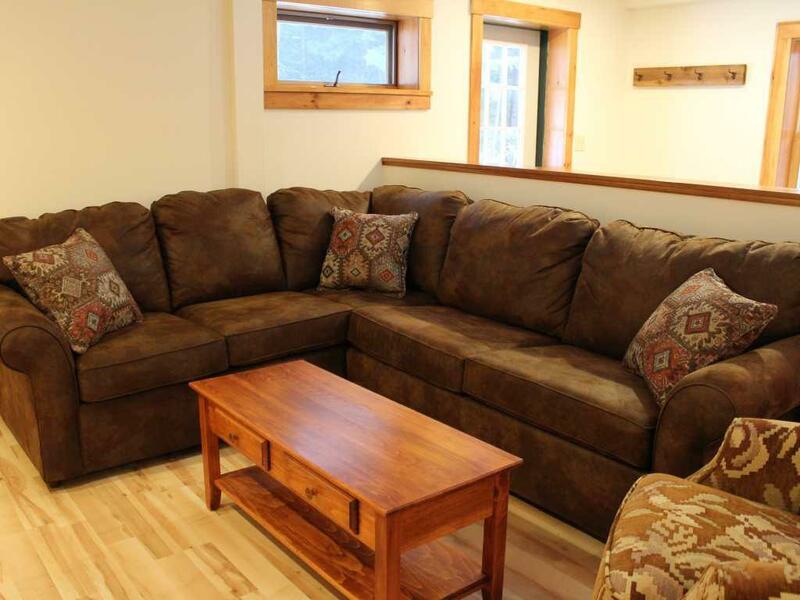 Unwind in your own plush sitting area, featuring a love seat and over-sized reading chair. 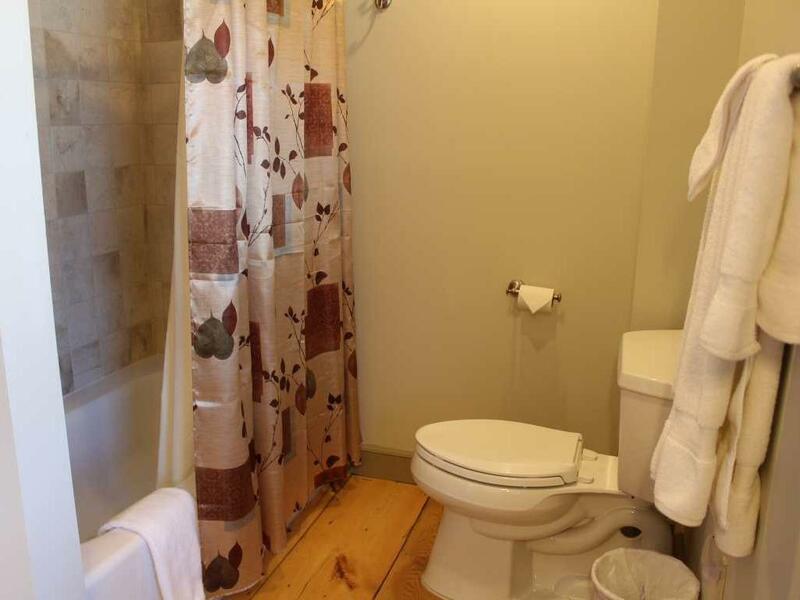 Enjoy the privacy of your own bath. 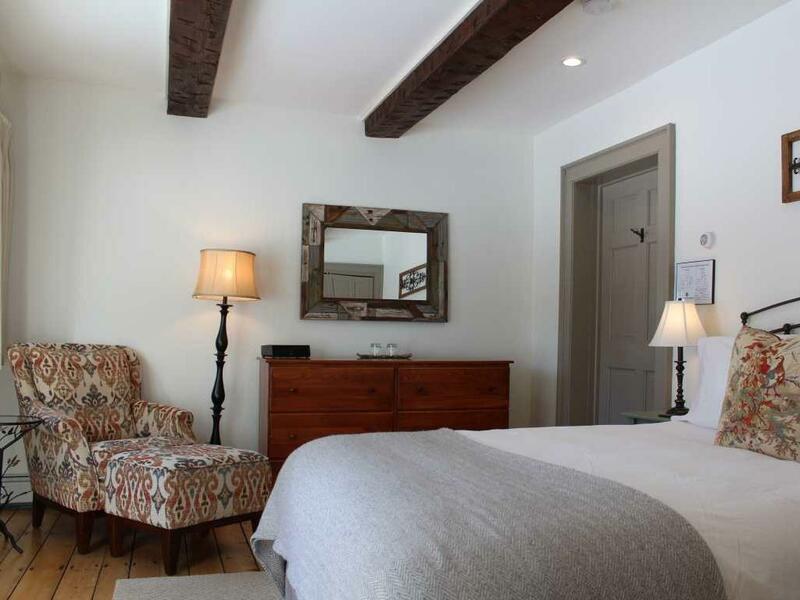 Located on the second floor, this room has classic farmhouse details and soft grays with rich, red features. 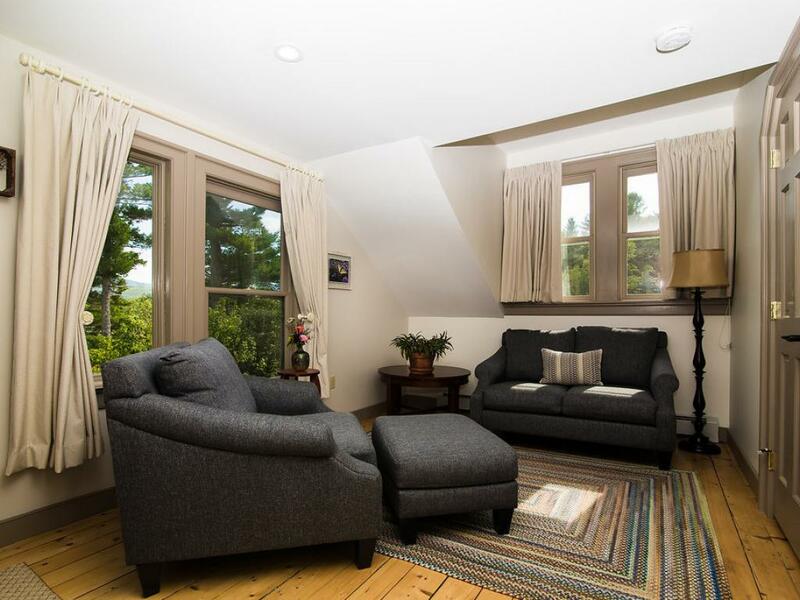 Relax in your comfortable reading chair with ottoman as you sip your coffee or cozy up with a glass of wine at the end of your day’s adventure. 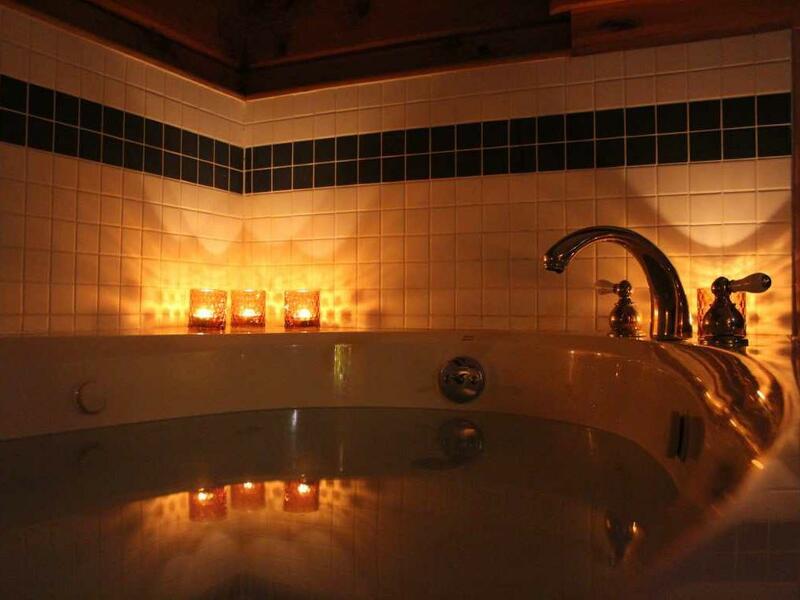 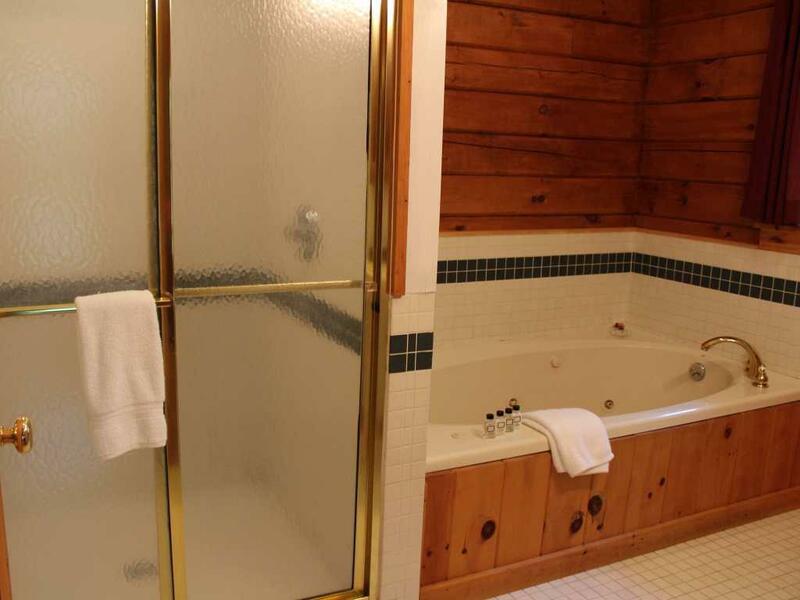 Indulge in our deluxe amenities in your large private bath. 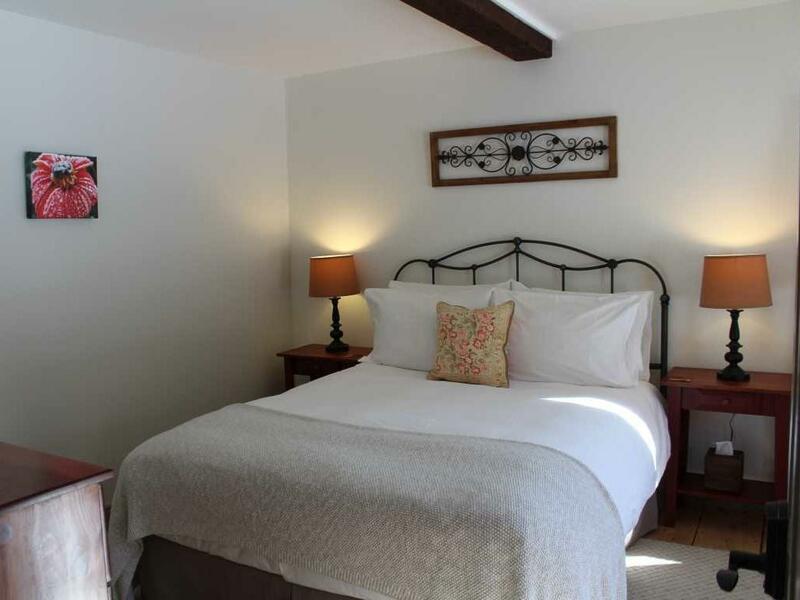 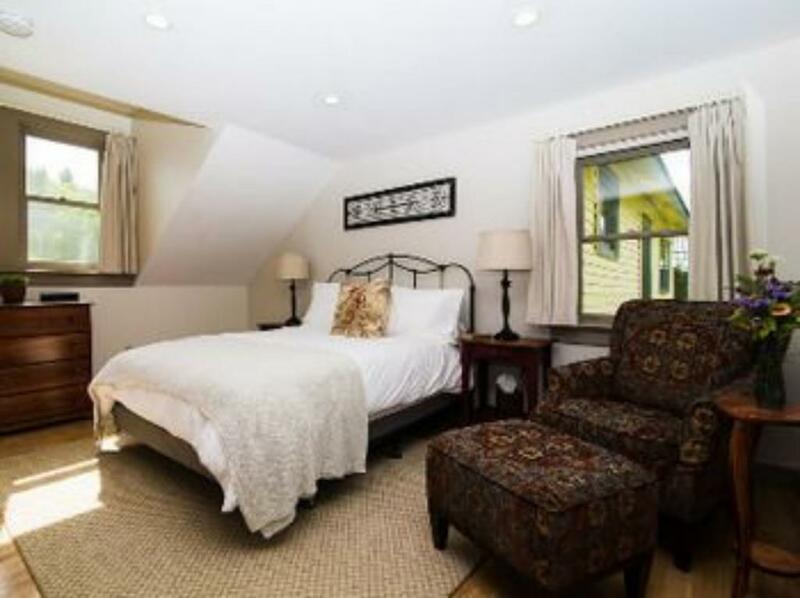 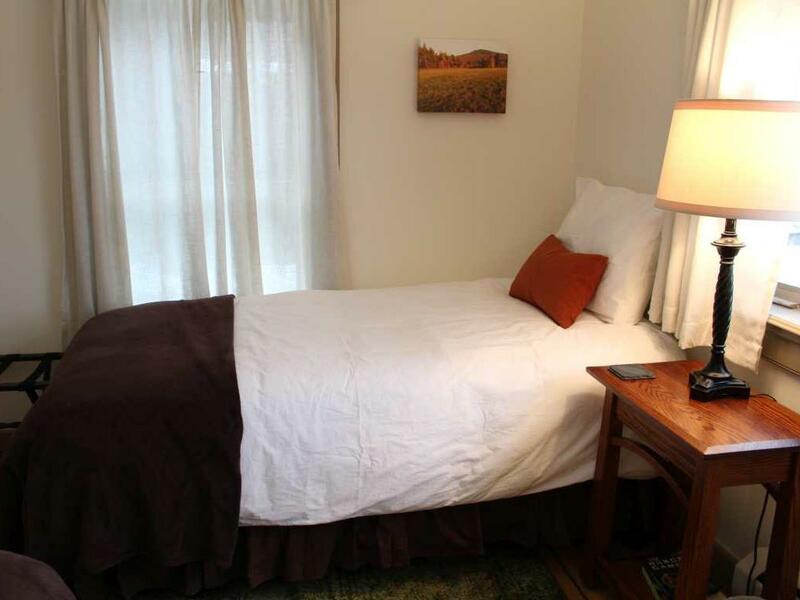 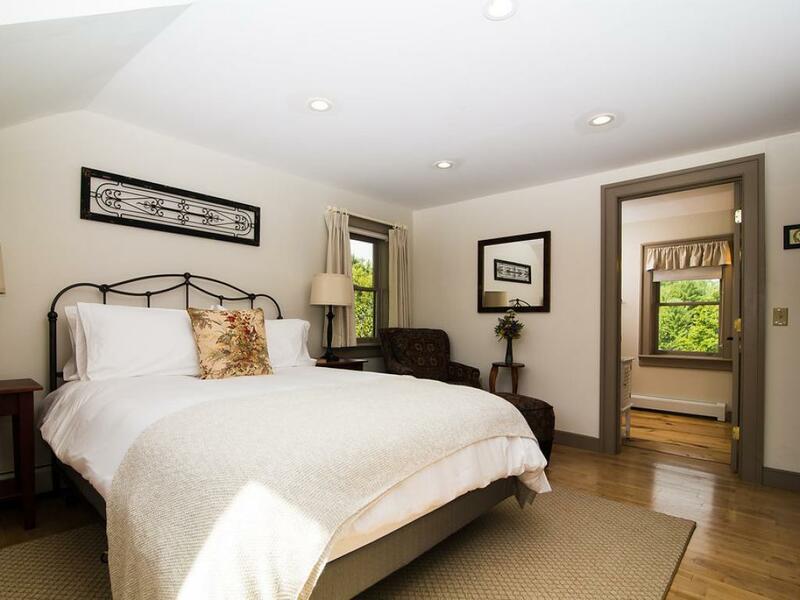 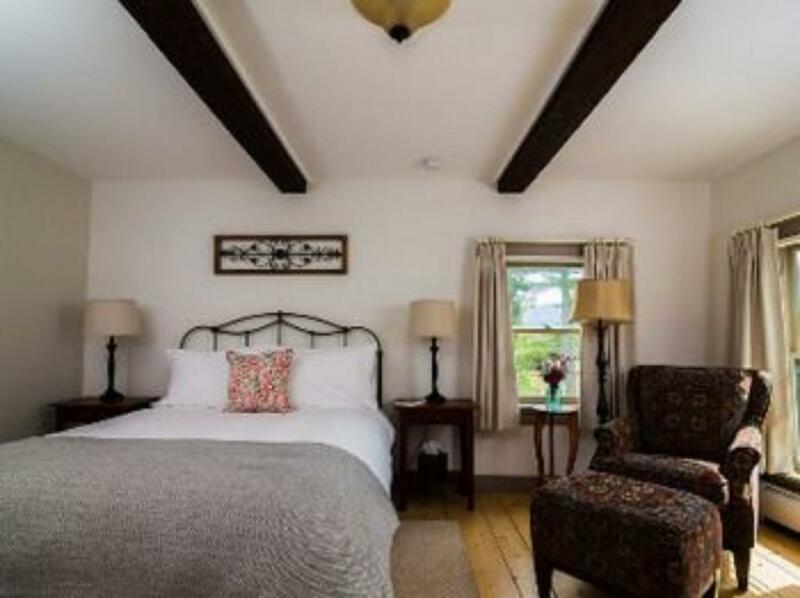 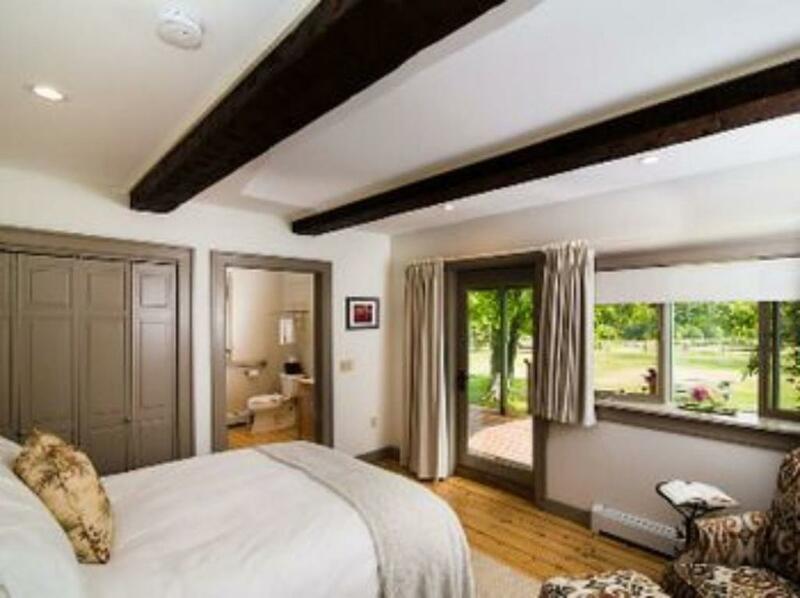 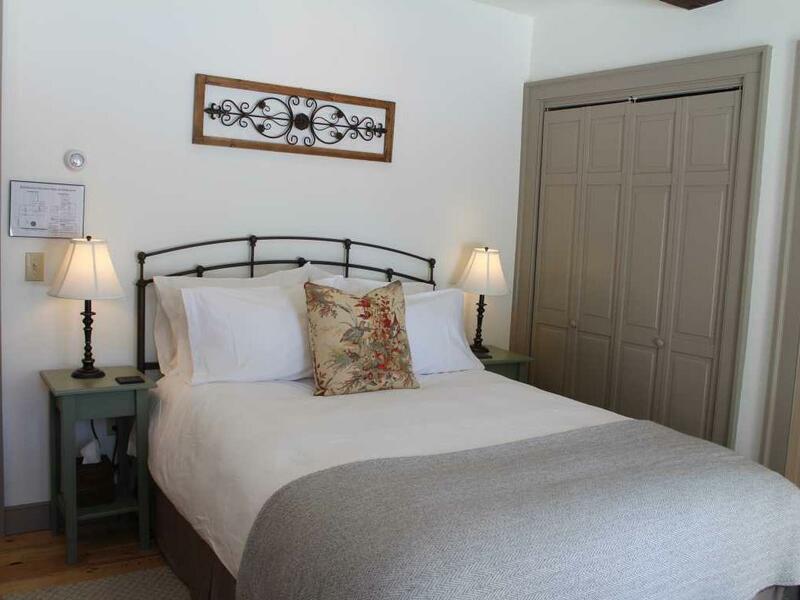 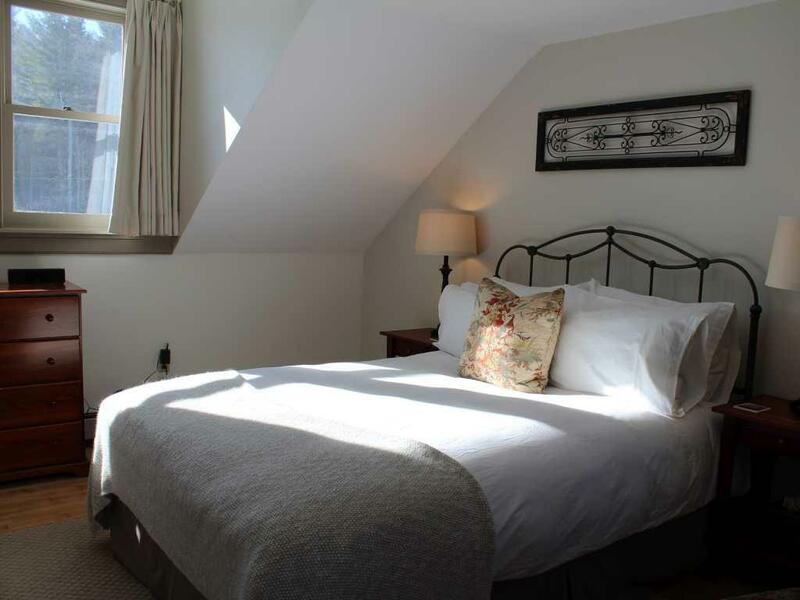 This room has two single beds, ideal for friends or family traveling together. 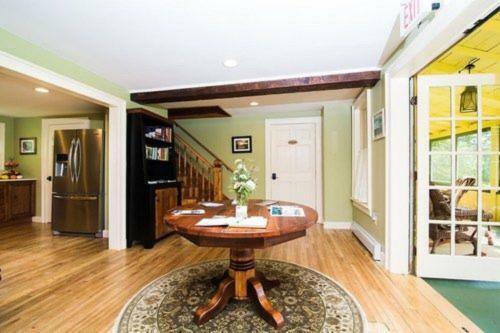 This room shares a bathroom across the hall with Oak and Pine Rooms on the same staircase landing. 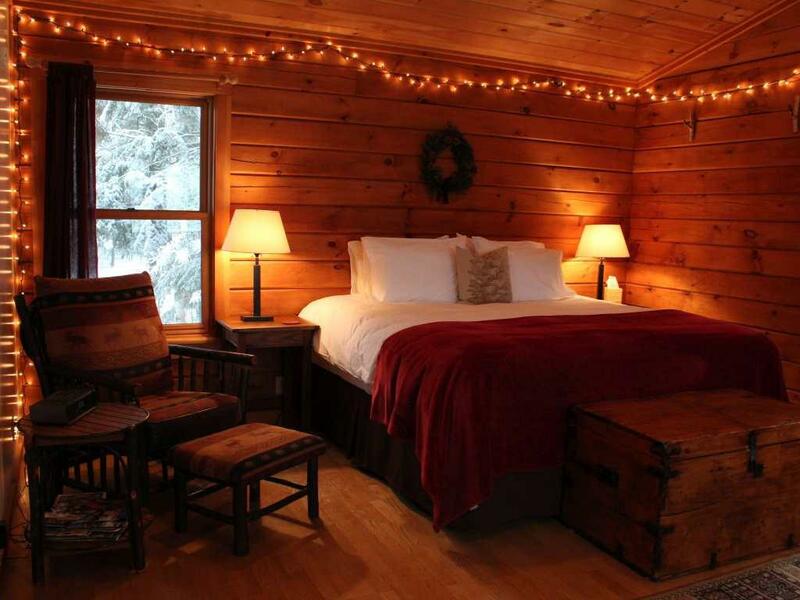 Oak, Pine, and Larch are also great rented together for friends or family traveling together. 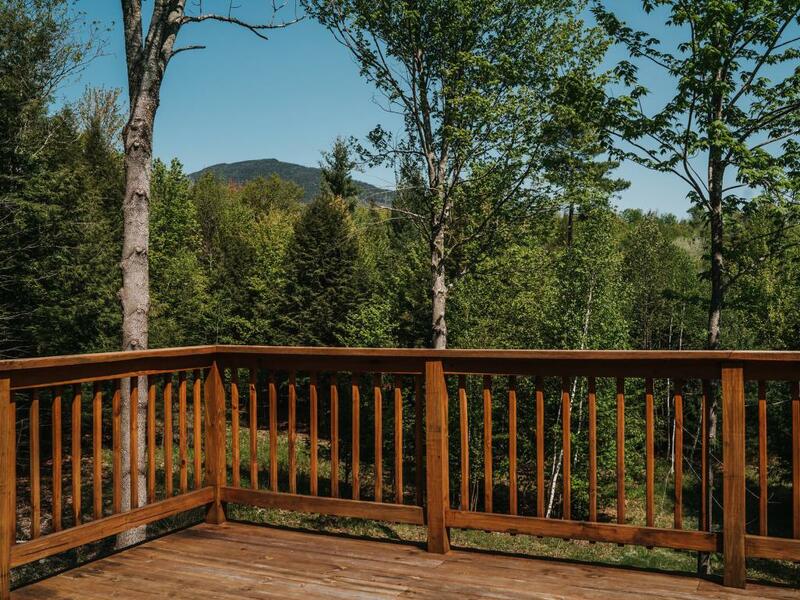 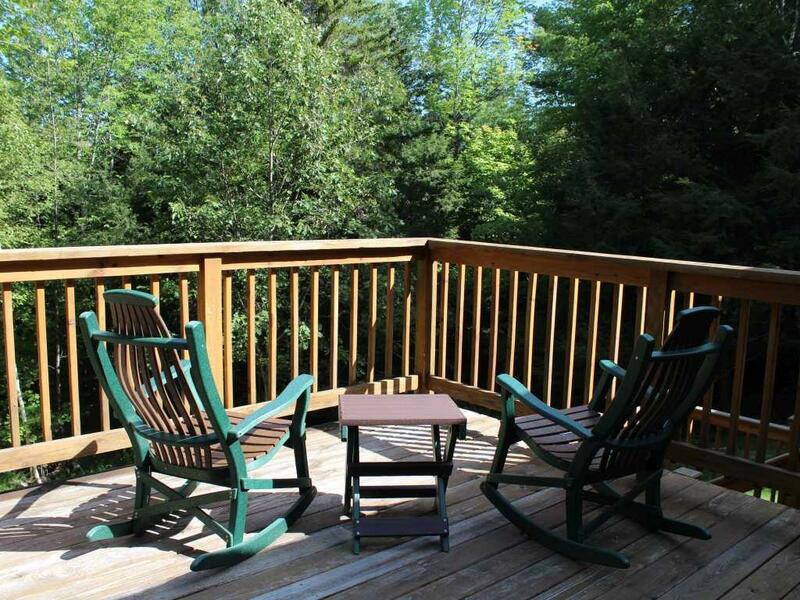 Watch the stars emerge from the sky from your own private deck. 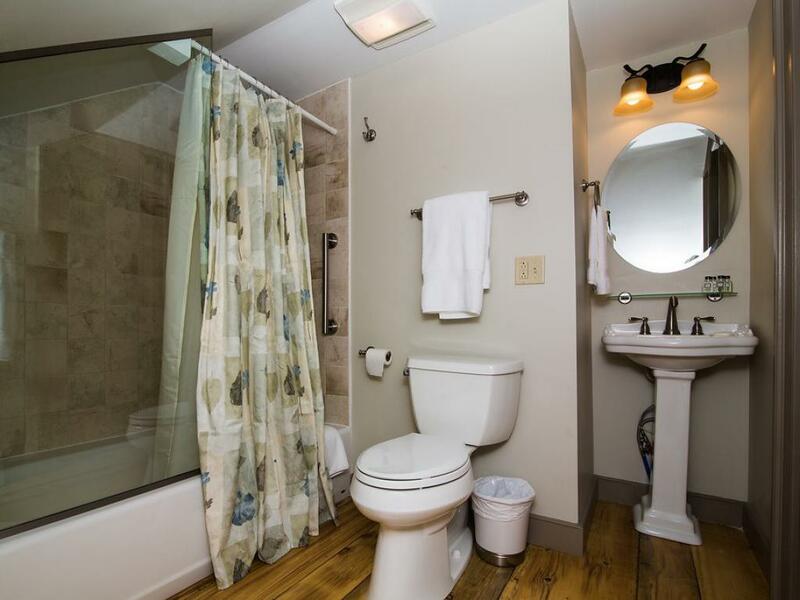 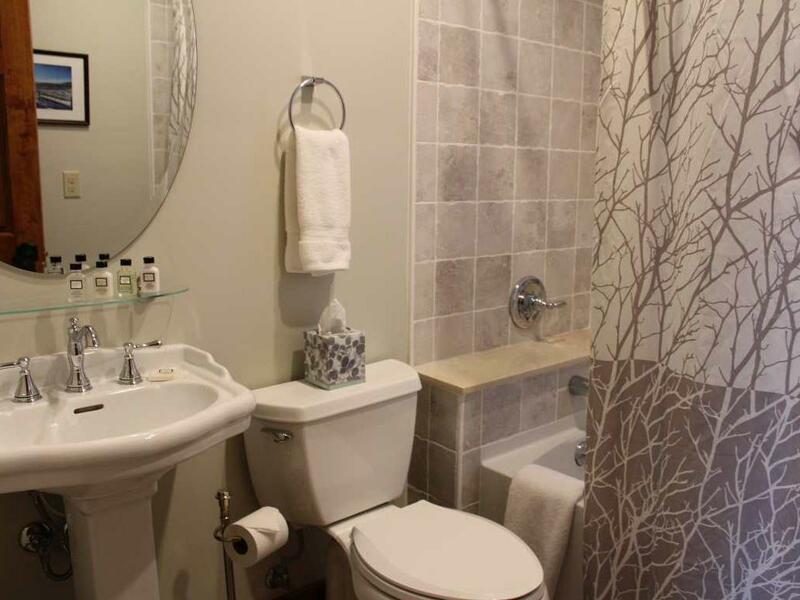 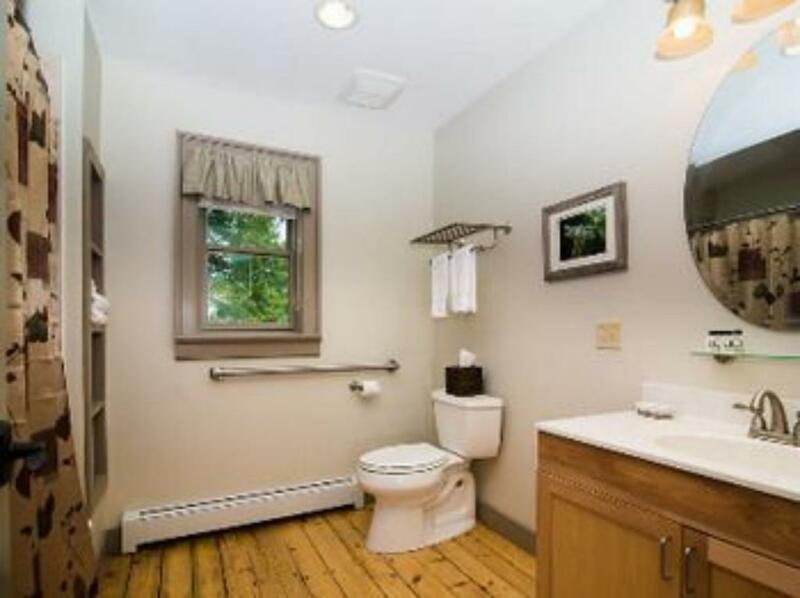 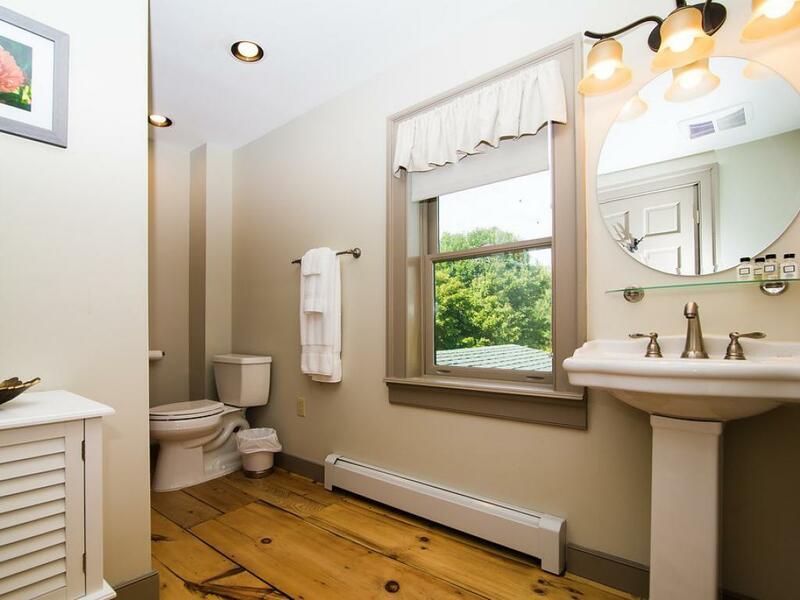 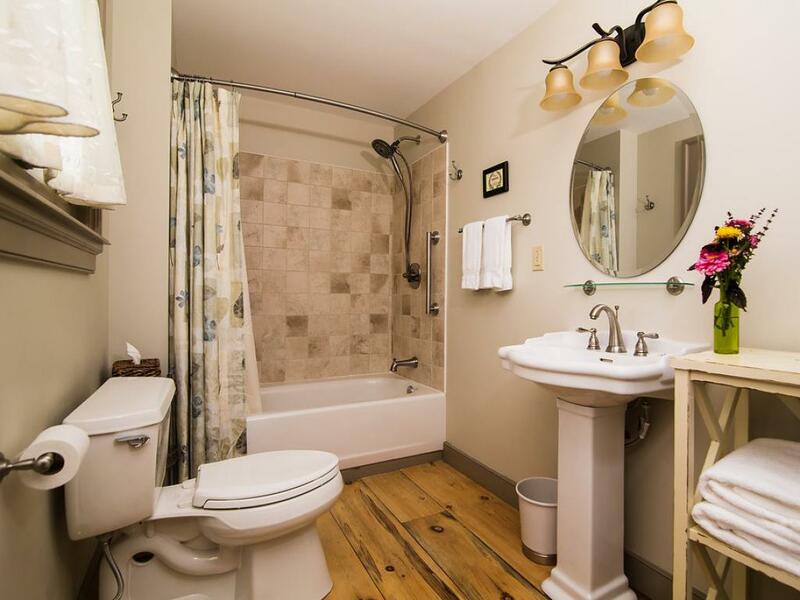 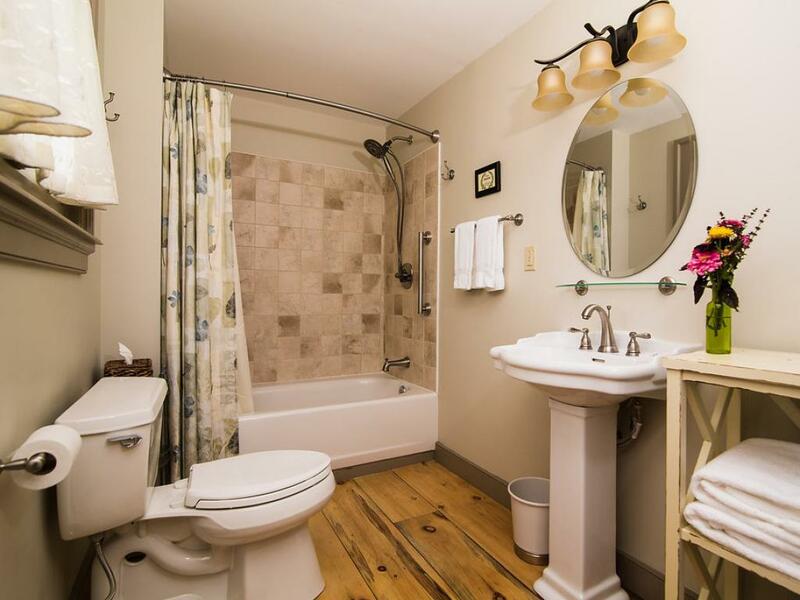 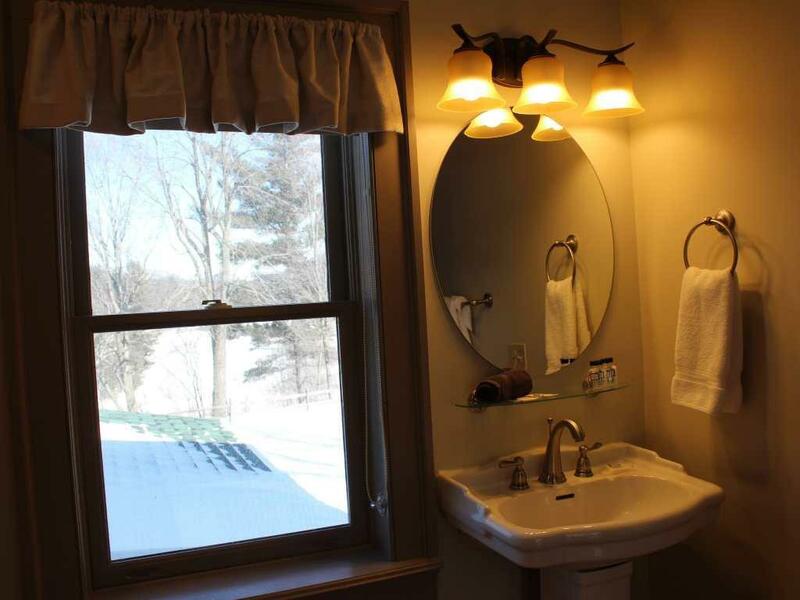 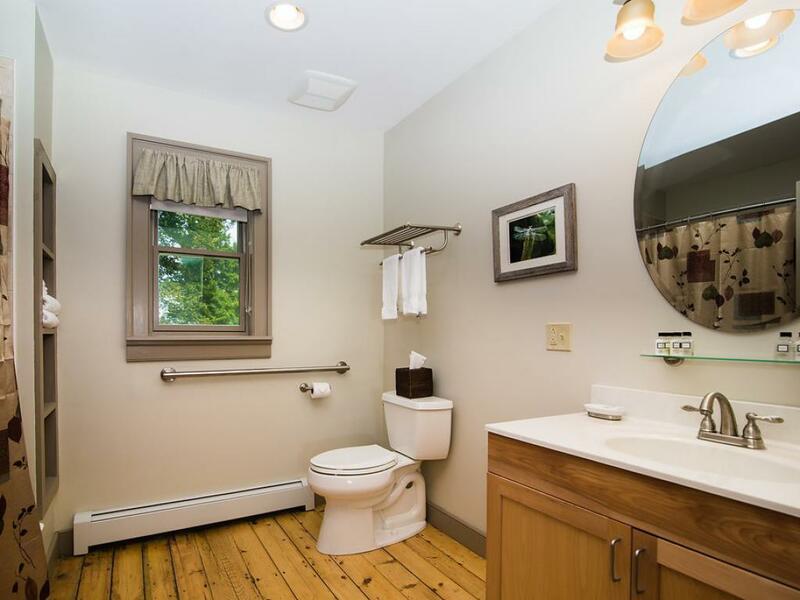 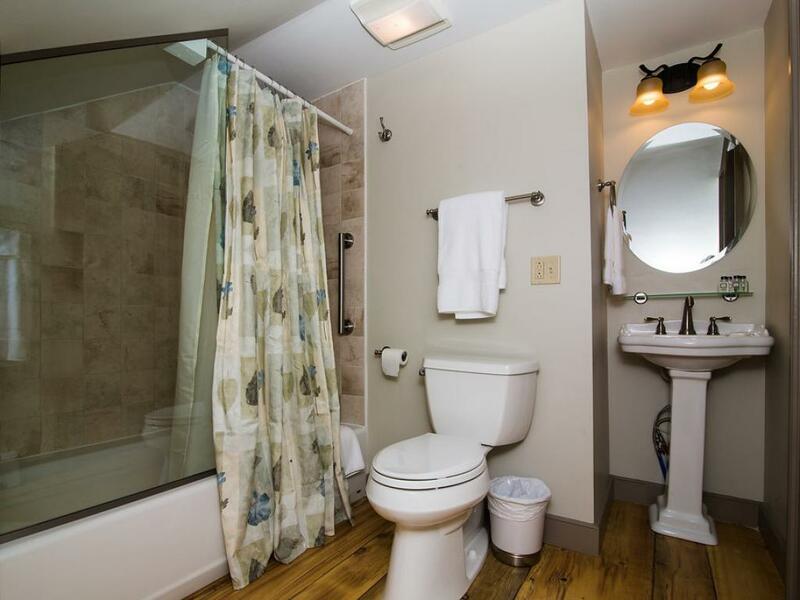 This cozy, first floor room offers a private bath and will soothe the senses with its soft color palette. Equipped with our deluxe amenities, we invite you to sit back and relax in your comfortable reading chair with a favorite book while sipping on our home made tea from our garden. 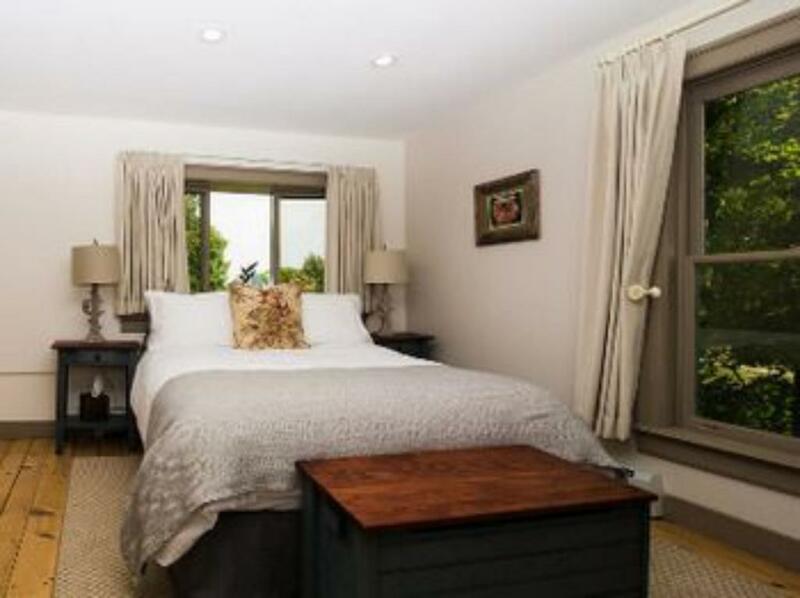 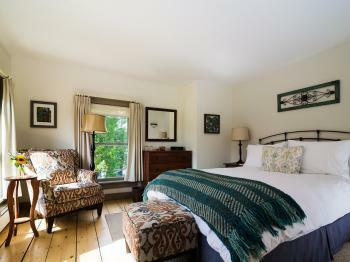 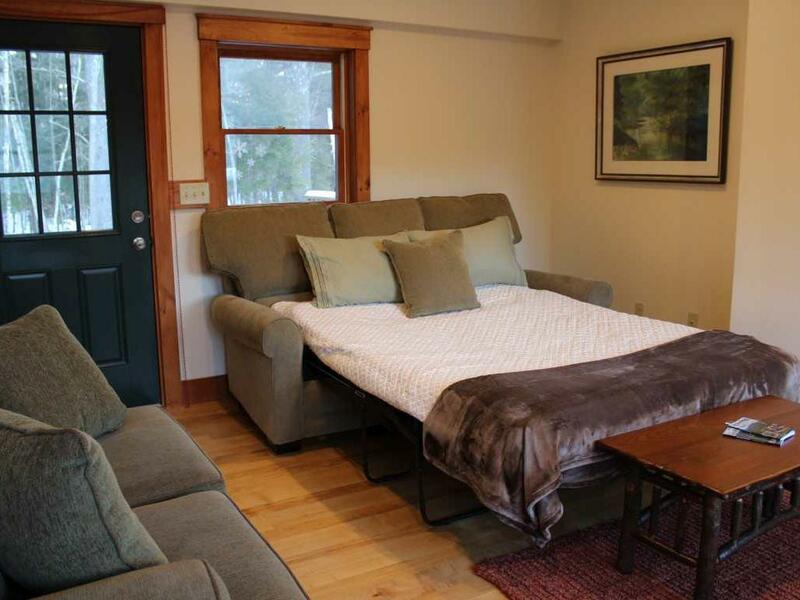 Private room with queen size beds and comfy chair - big windows and lots of sunlight. 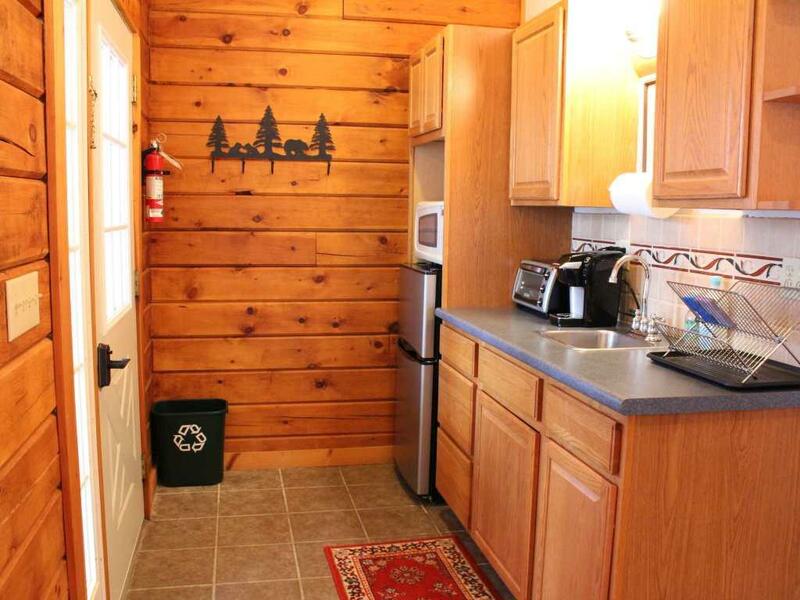 This room shares a bathroom down the hall with Pine and Larch Rooms. 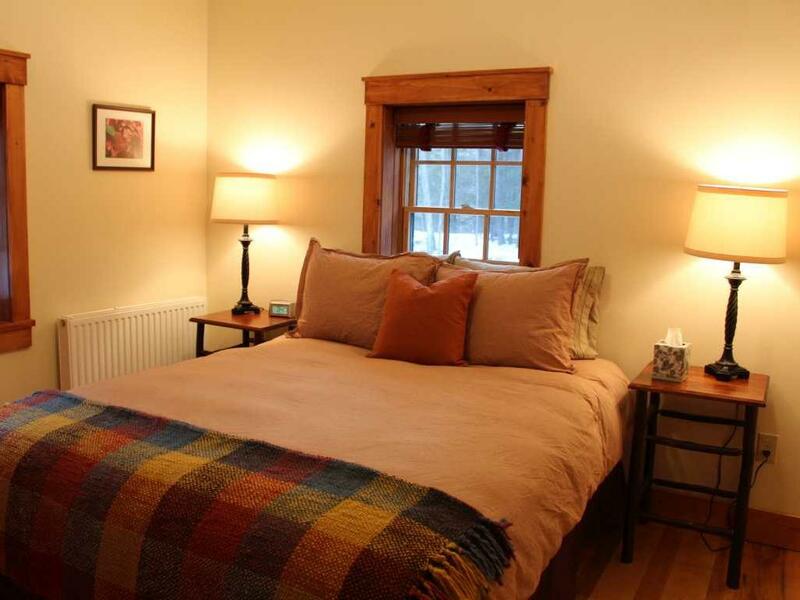 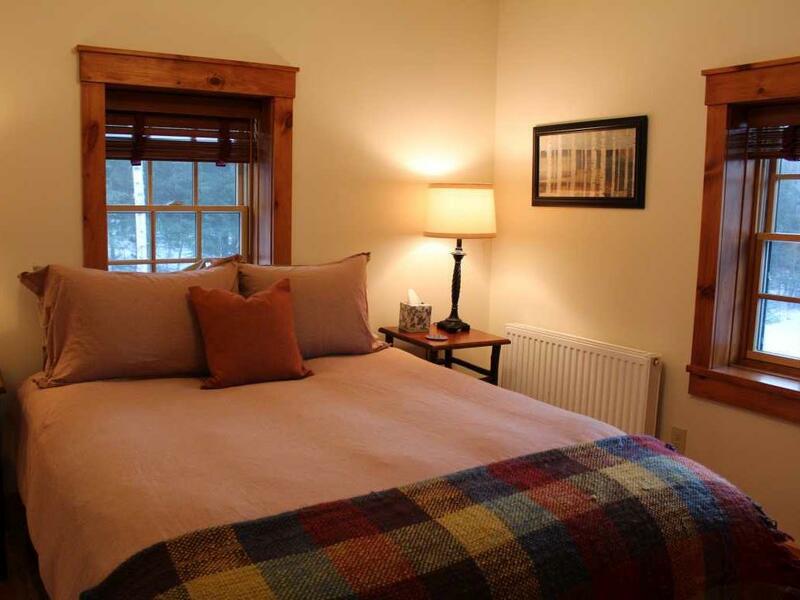 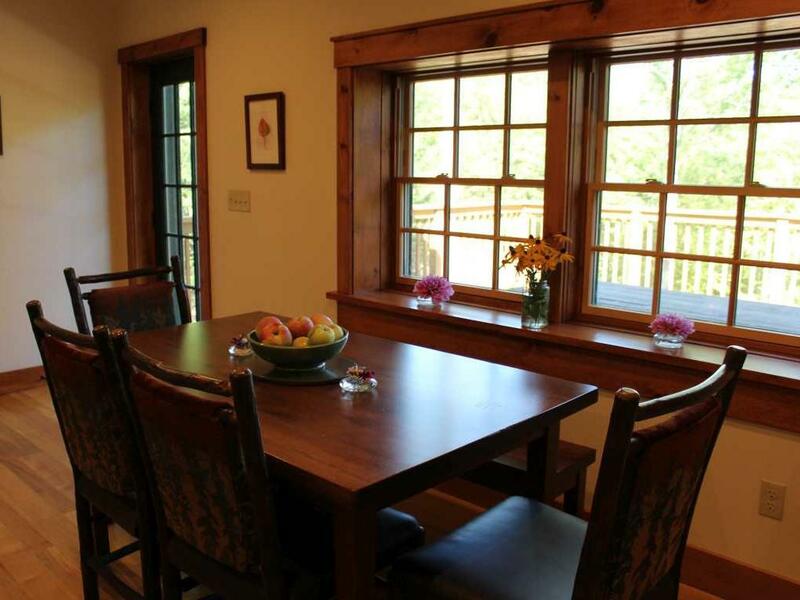 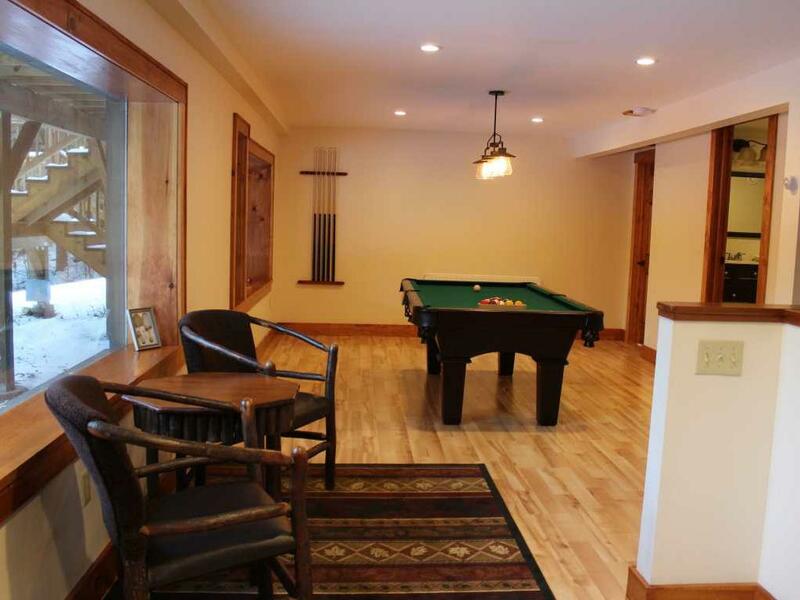 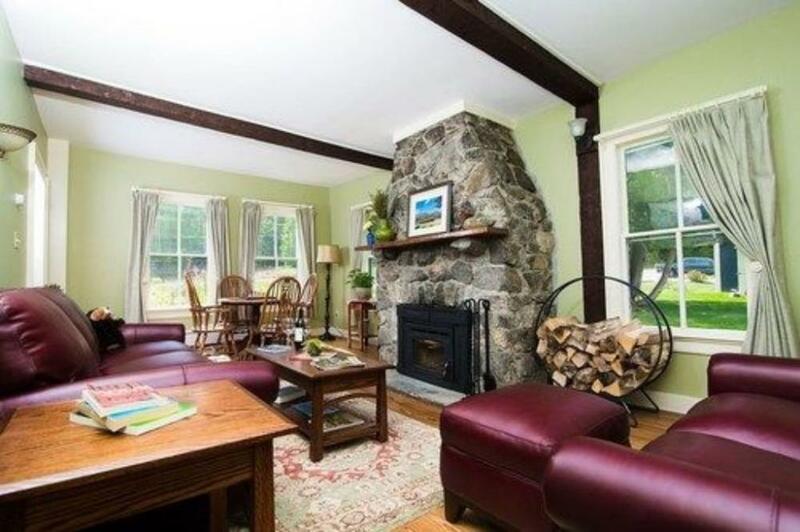 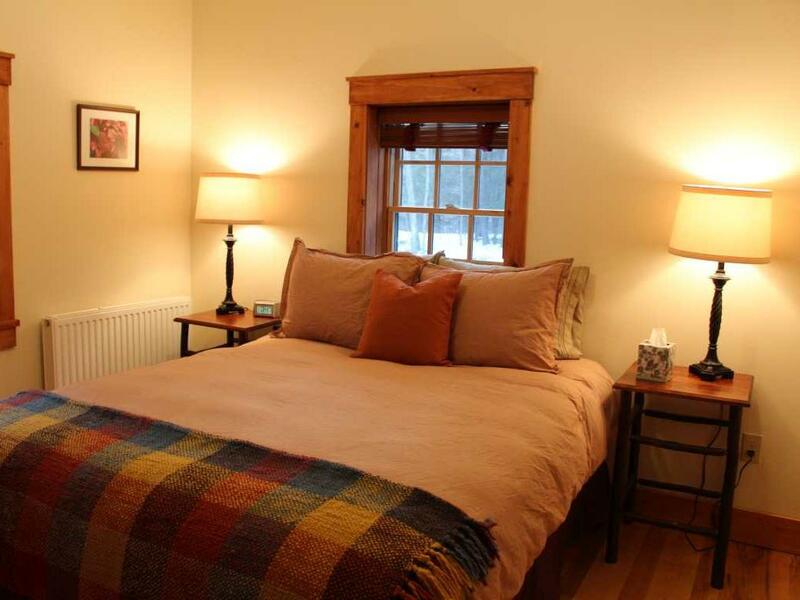 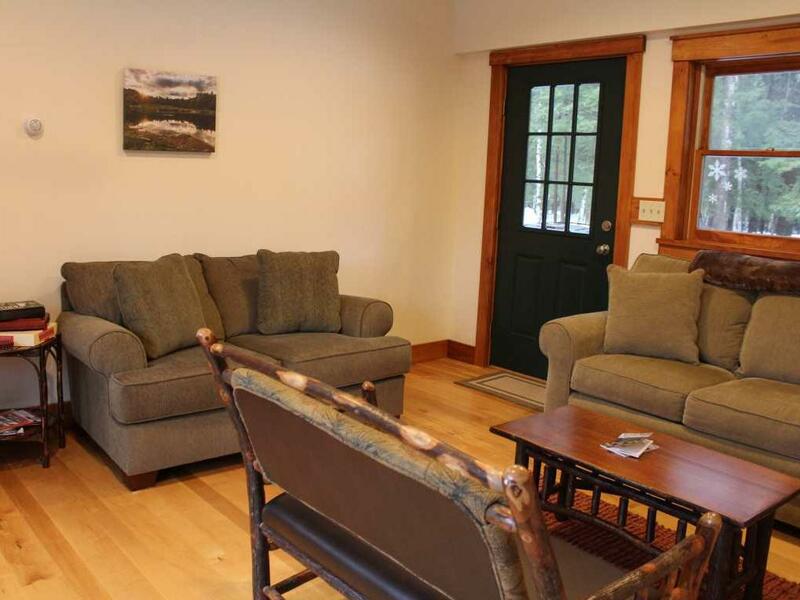 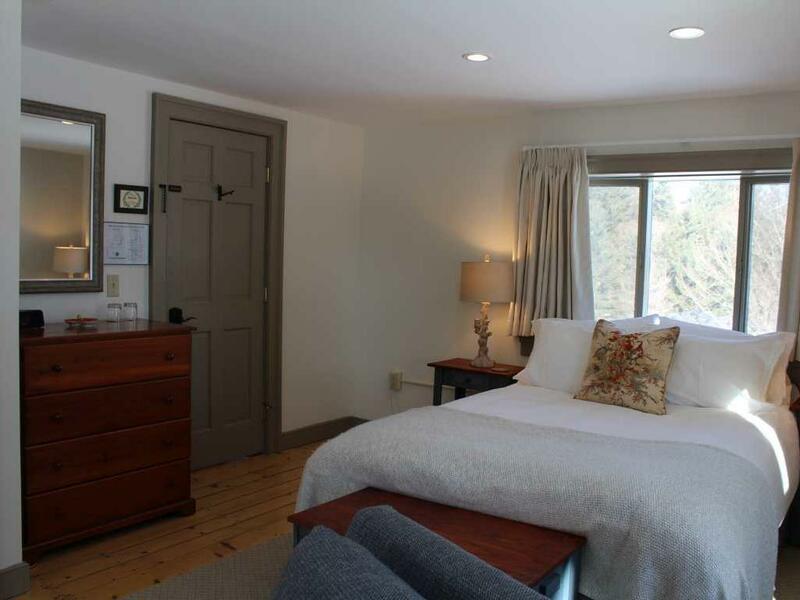 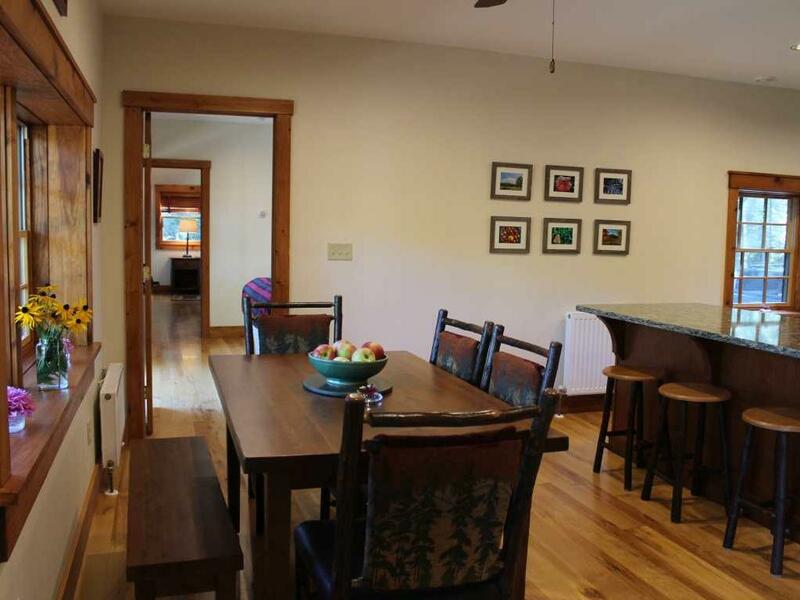 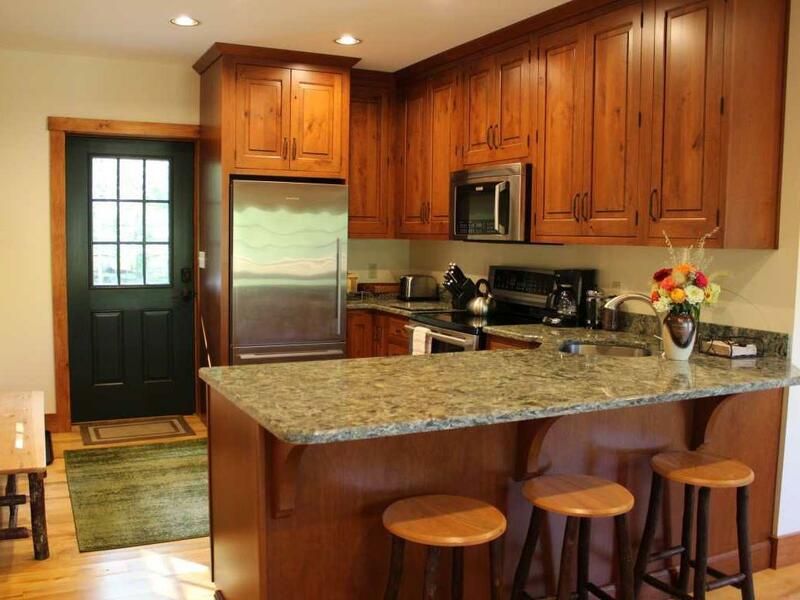 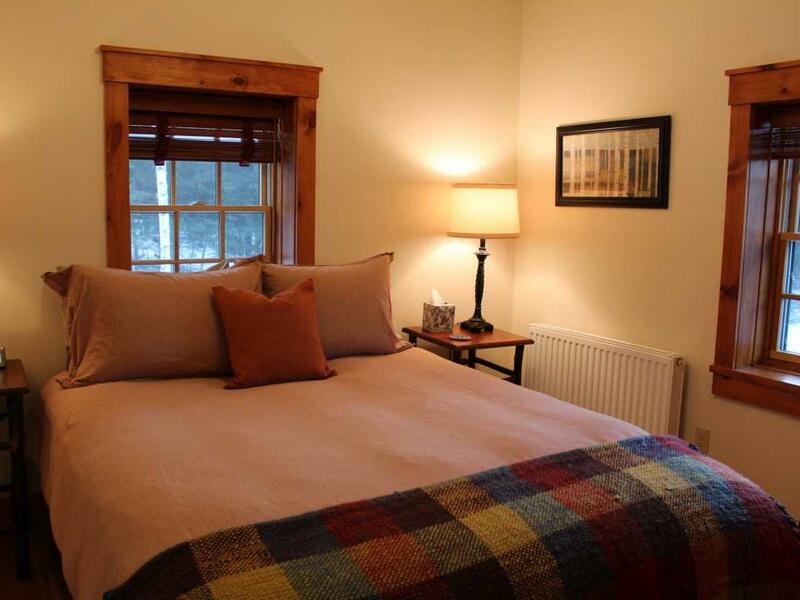 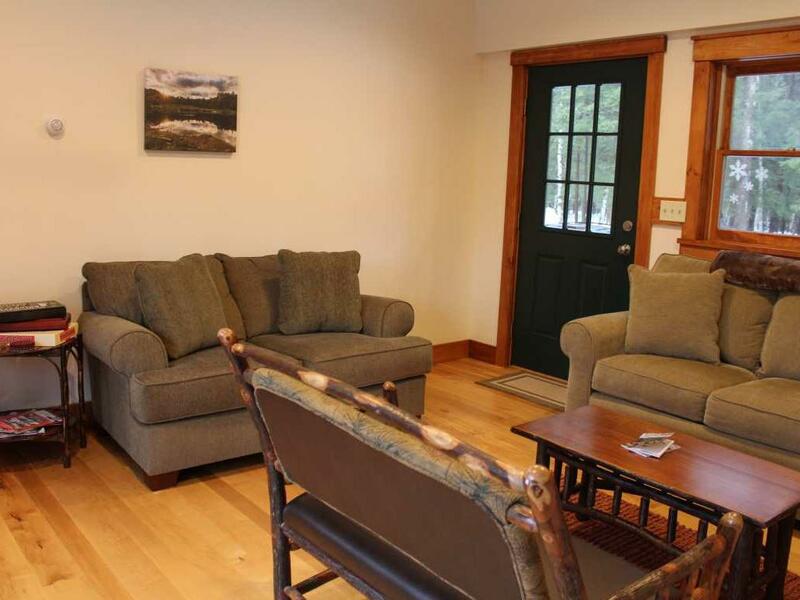 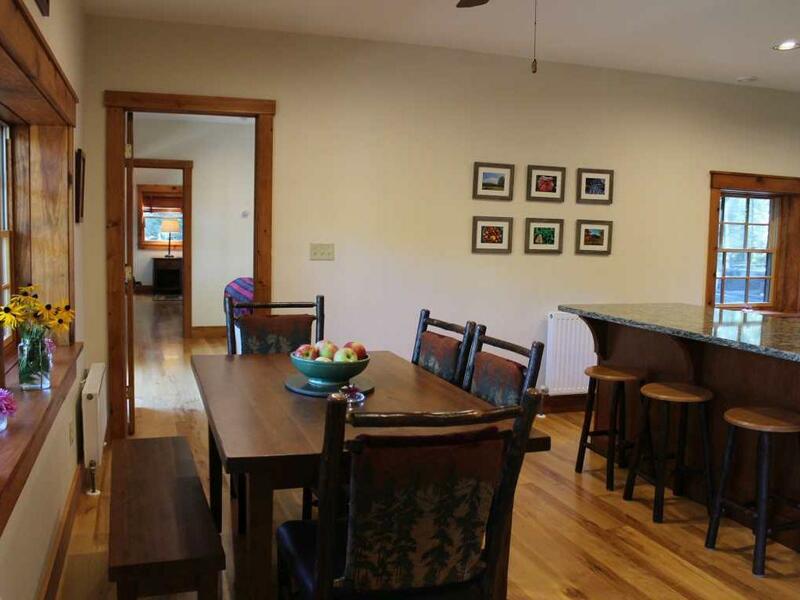 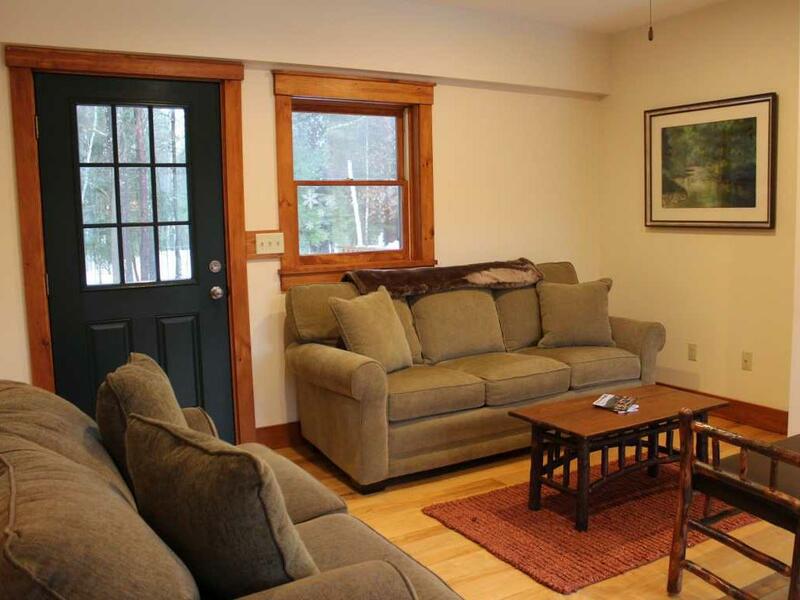 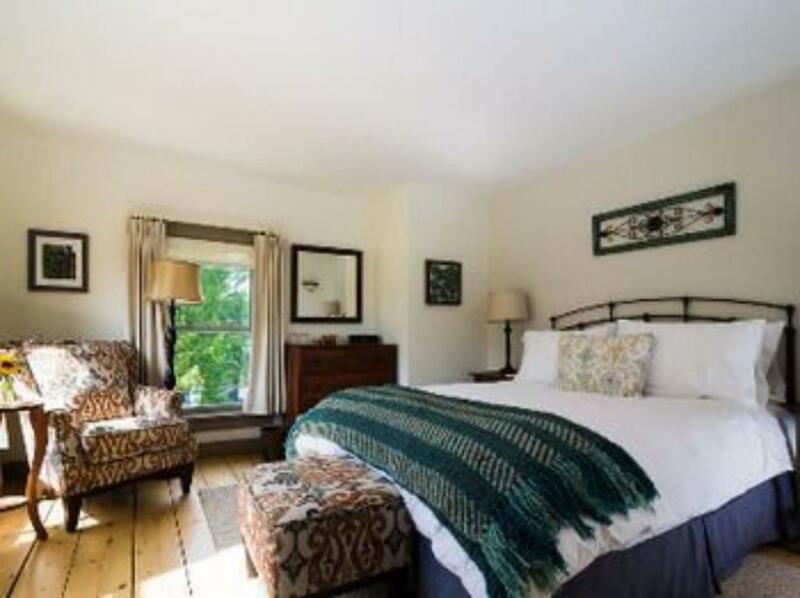 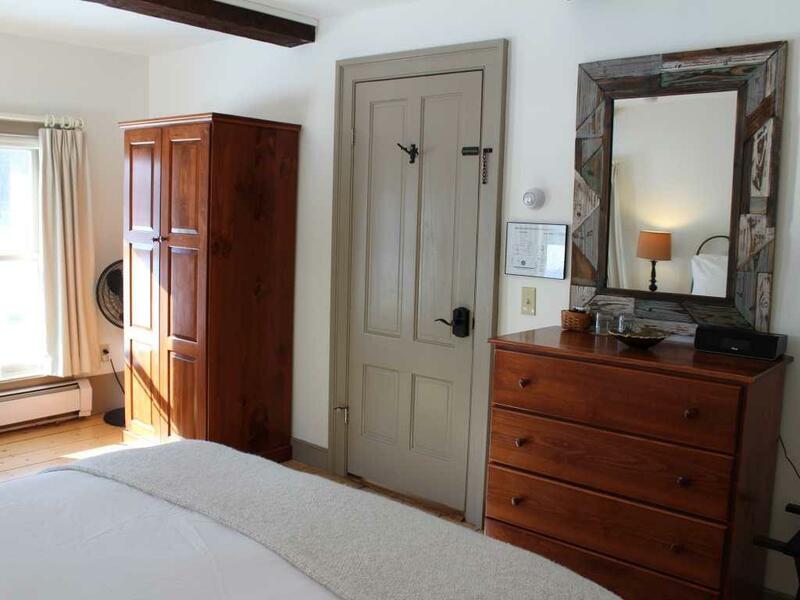 Oak, Pine, and Larch Rooms are also great rented together for a family or group of friends traveling together. 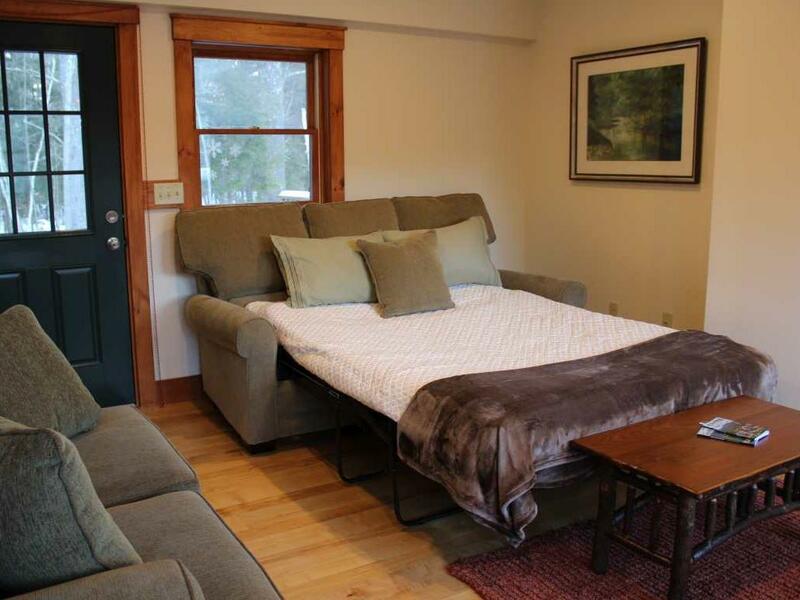 Private room with queen size beds and comfy chair - big windows and lots of sunlight. 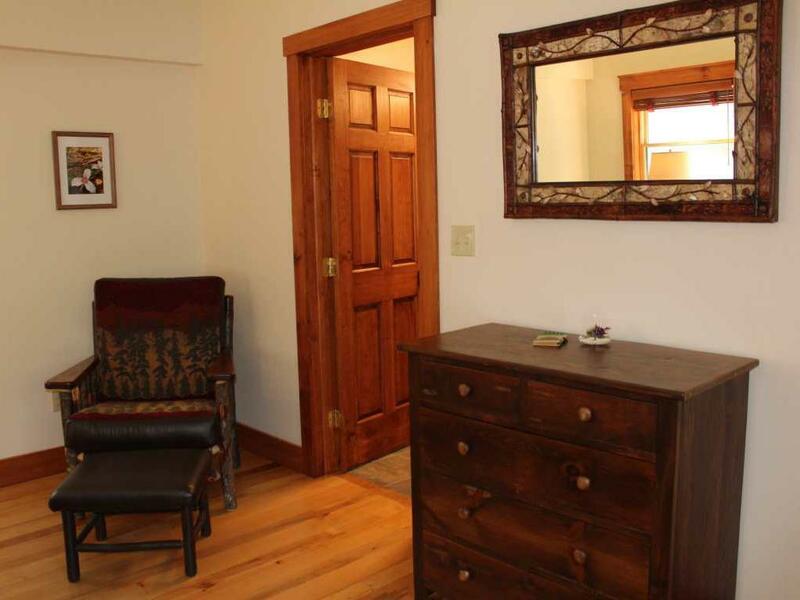 This room shares a bathroom down the hall with Oak and Larch Rooms. 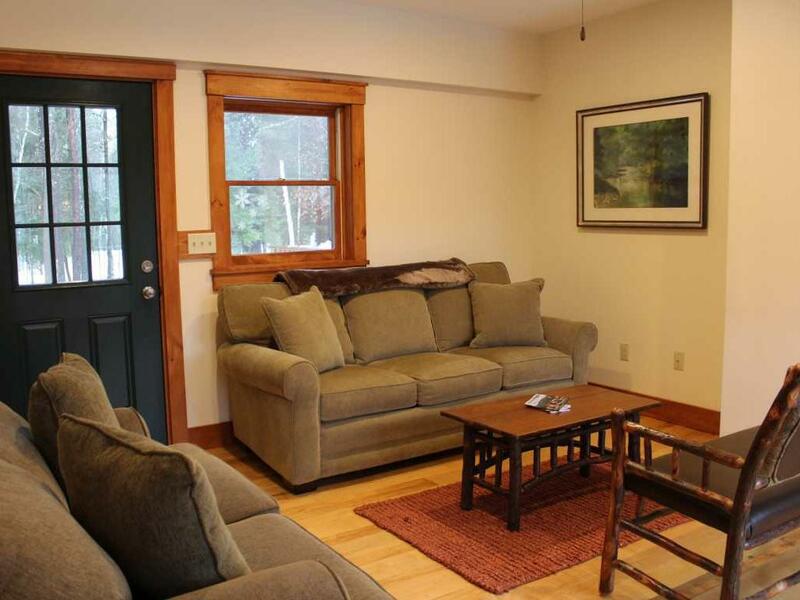 Oak, Pine, and Larch Rooms are also great rented together for a family or group of friends traveling together. 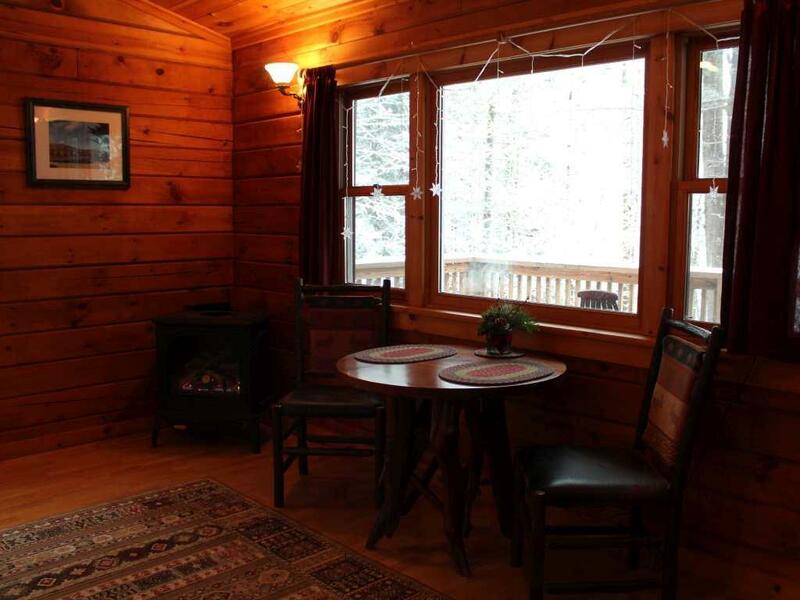 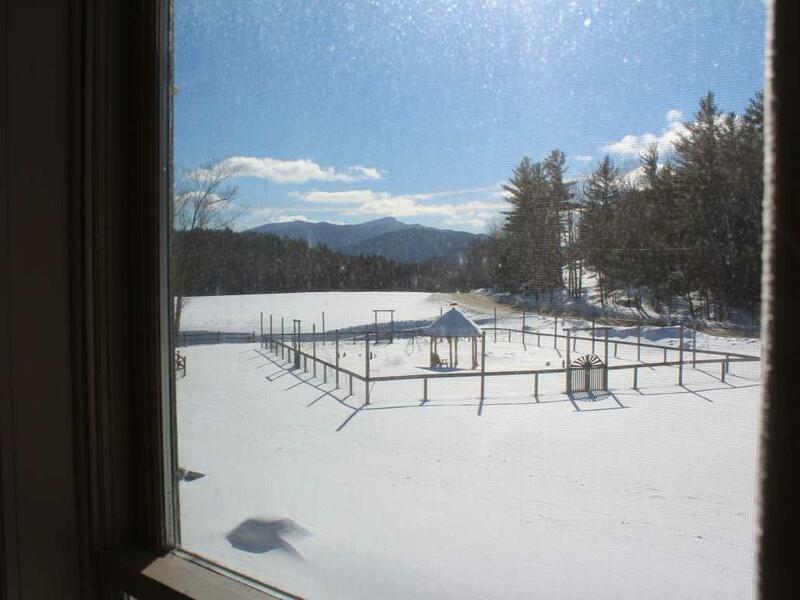 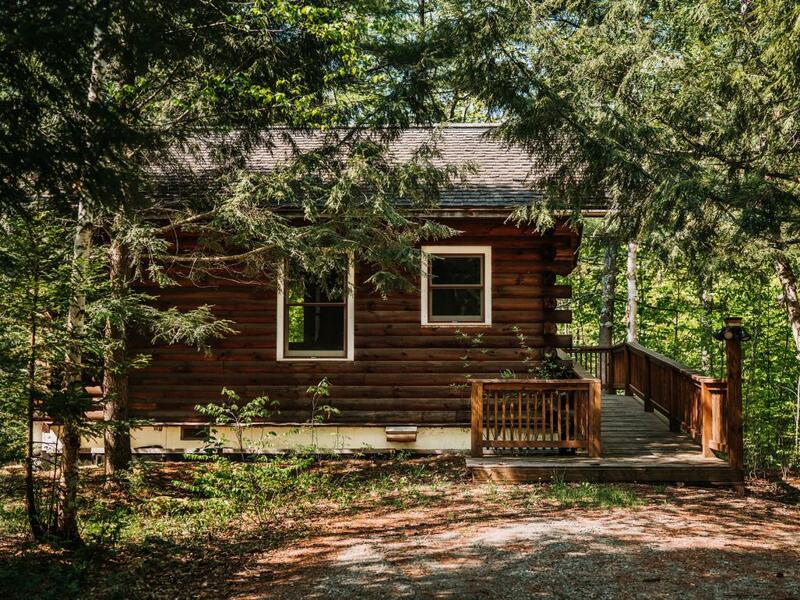 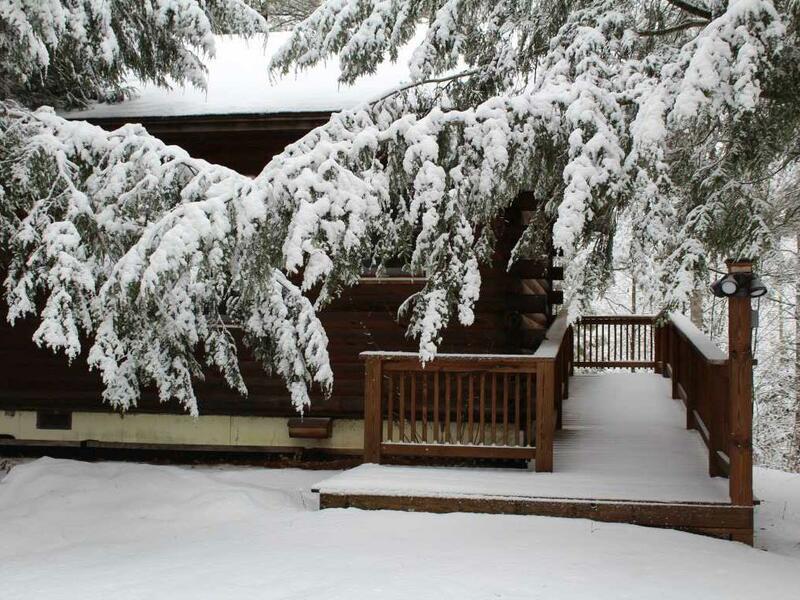 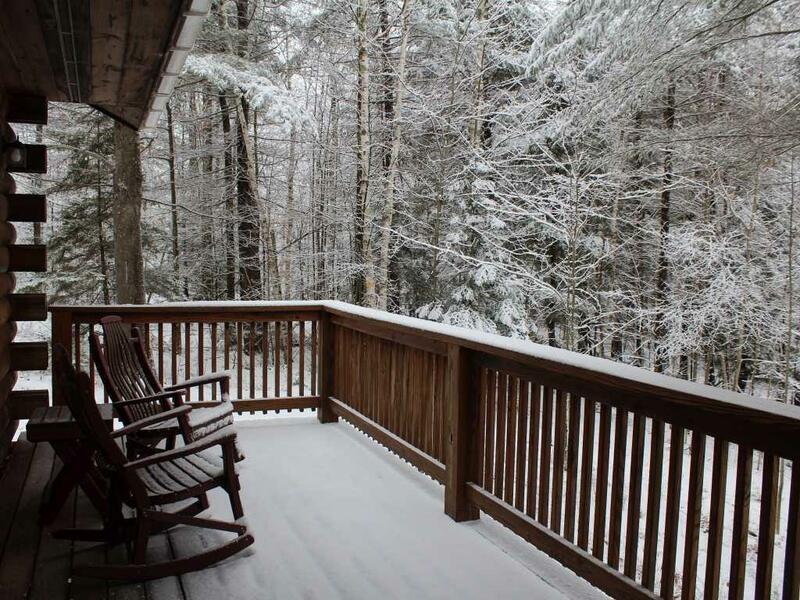 This private 1 bedroom cabin is perfect for a romantic getaway any time of year. 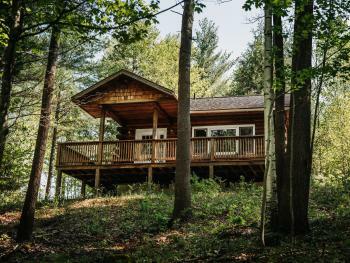 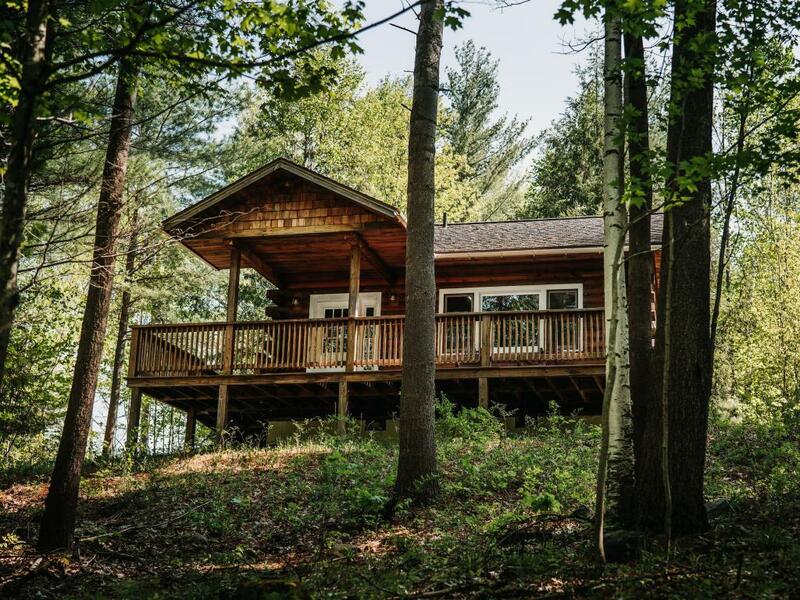 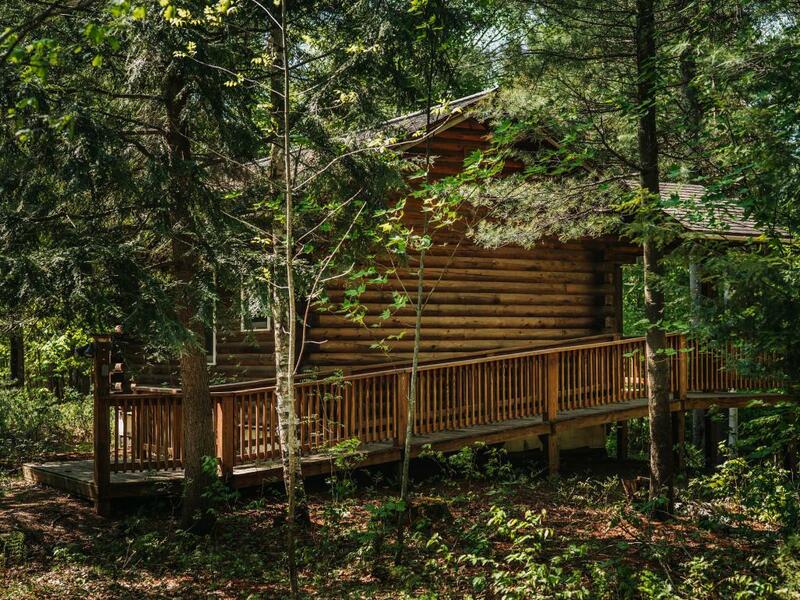 With a king size bed, jacuzzi tub, kitchenette, and a private deck surrounded by forest, you are bound to find the relaxation you've been needing. More interior pictures coming soon once we finalize the décor. 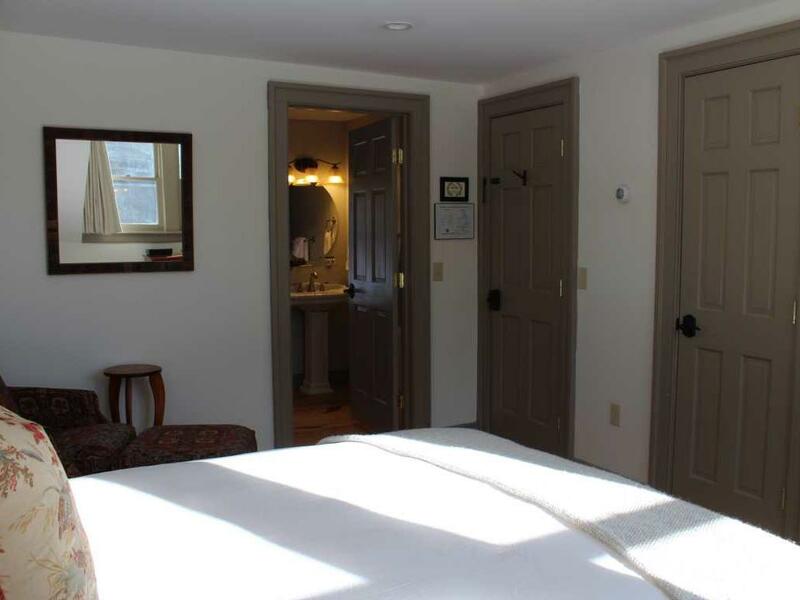 We offer a variety of experiences and accommodations to our guests and hope that there is something here to delight and inspire all that pass through our doors. 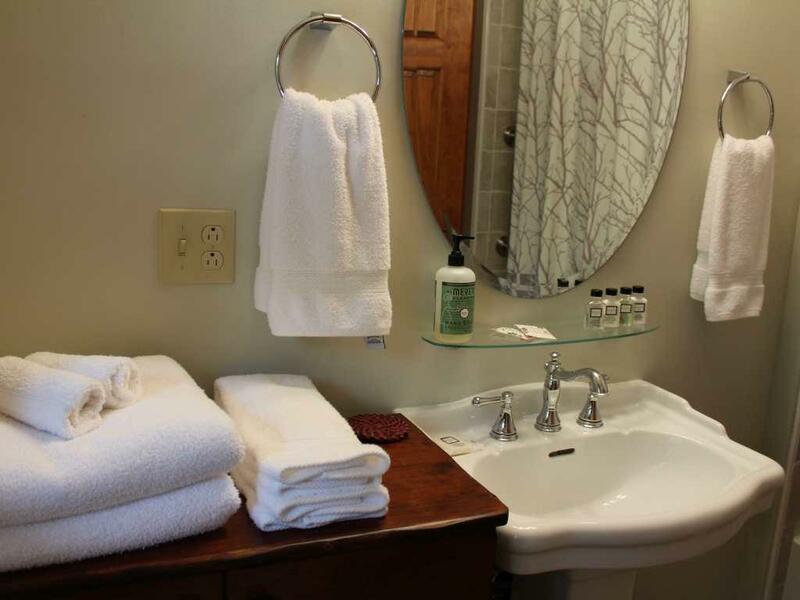 We pride ourselves in providing a high standard of cleanliness, comfort, and care. 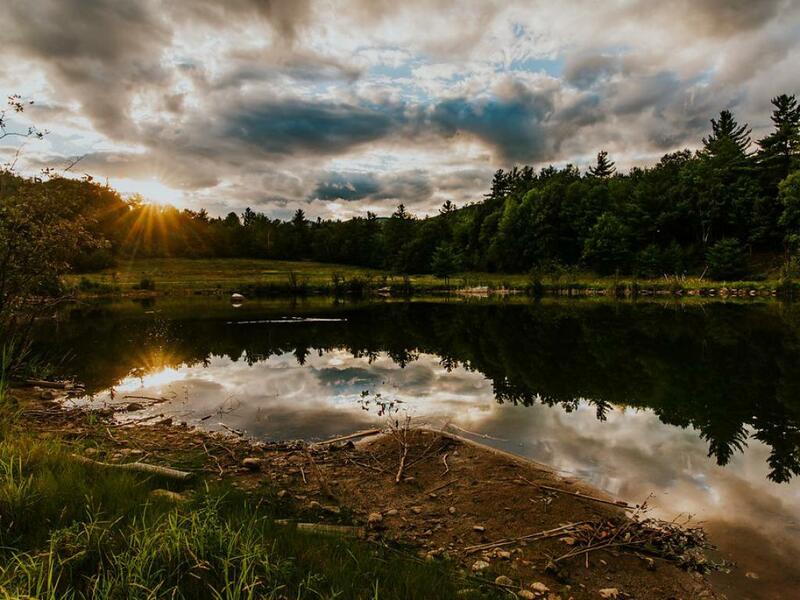 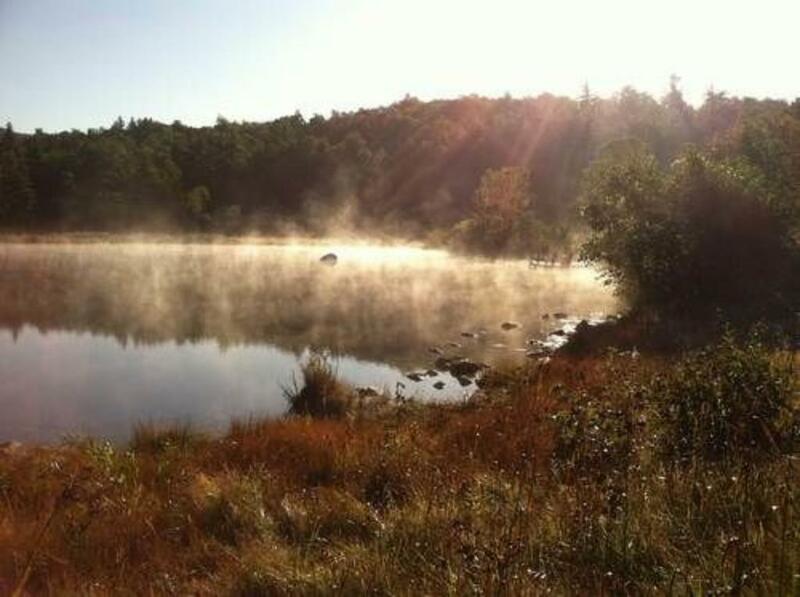 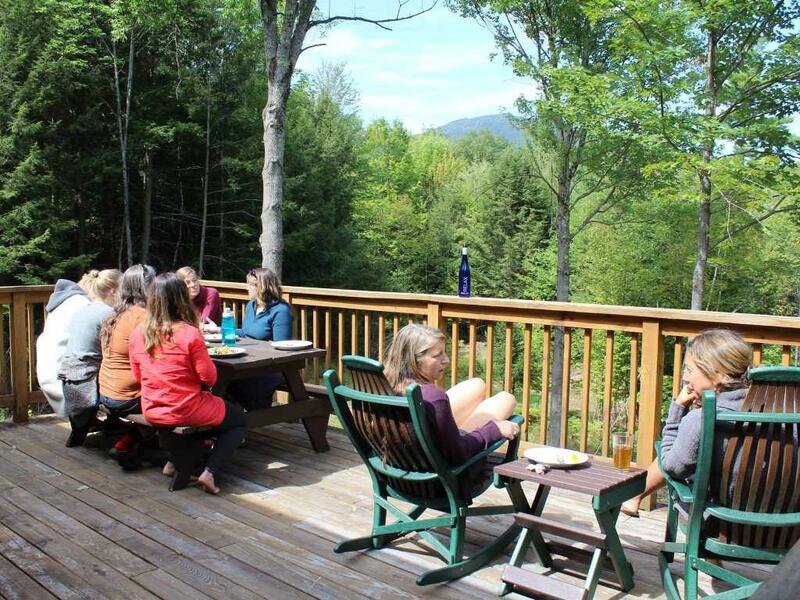 It is our aim to give you the opportunity to disconnect from the grind of daily life, and reconnect with yourselves, your families, and the wonders of the natural world at our doorstep. 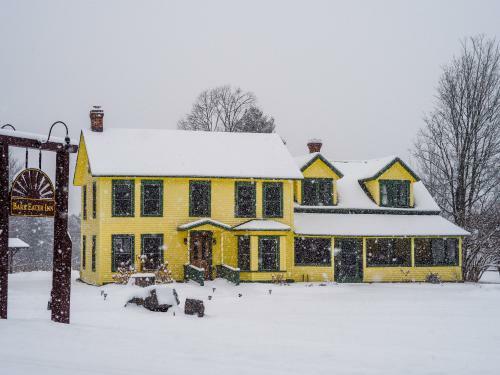 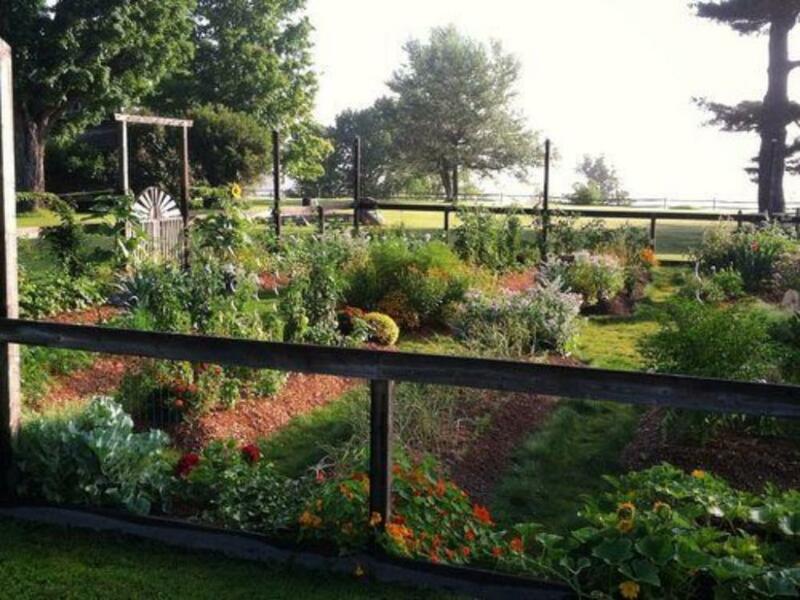 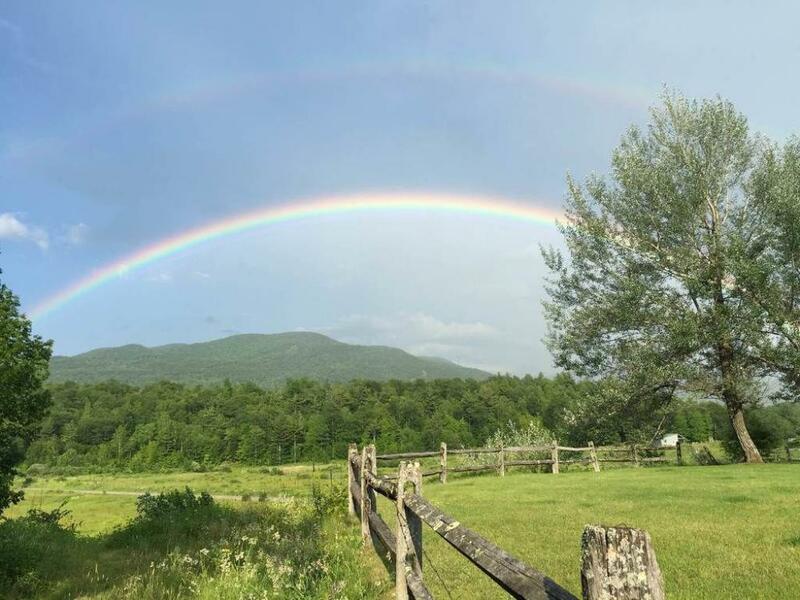 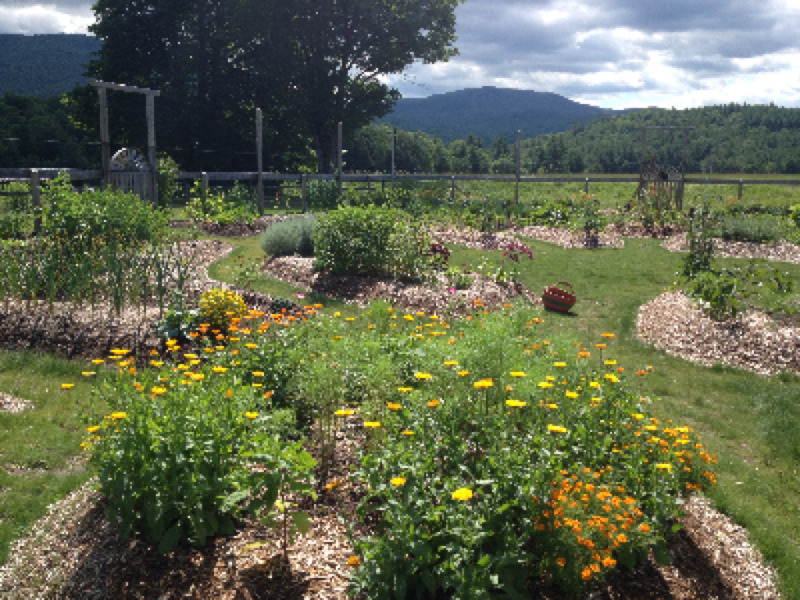 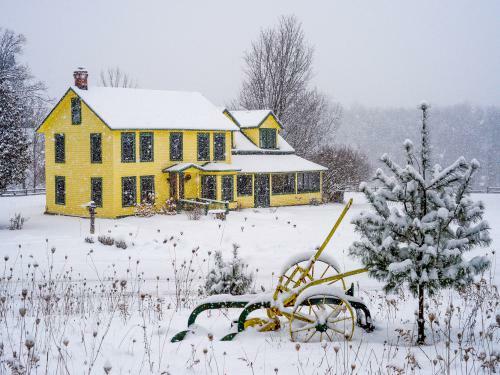 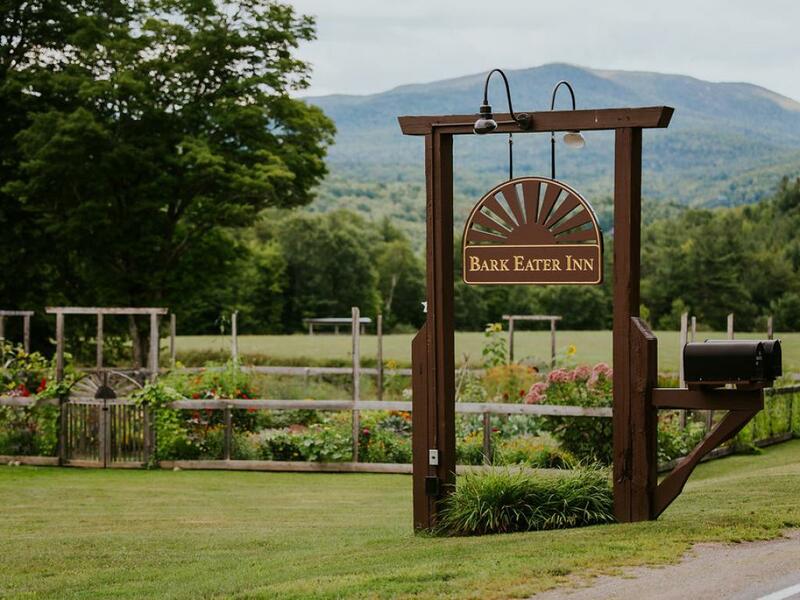 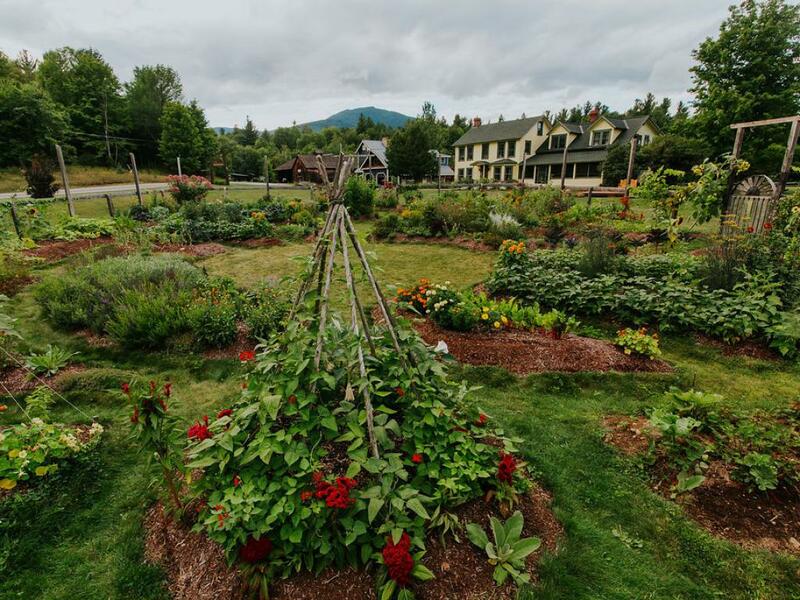 Our main Inn is a farm to table bed and breakfast where we serve hyper local dishes made with ingredients from our own back yard and our community farmers. 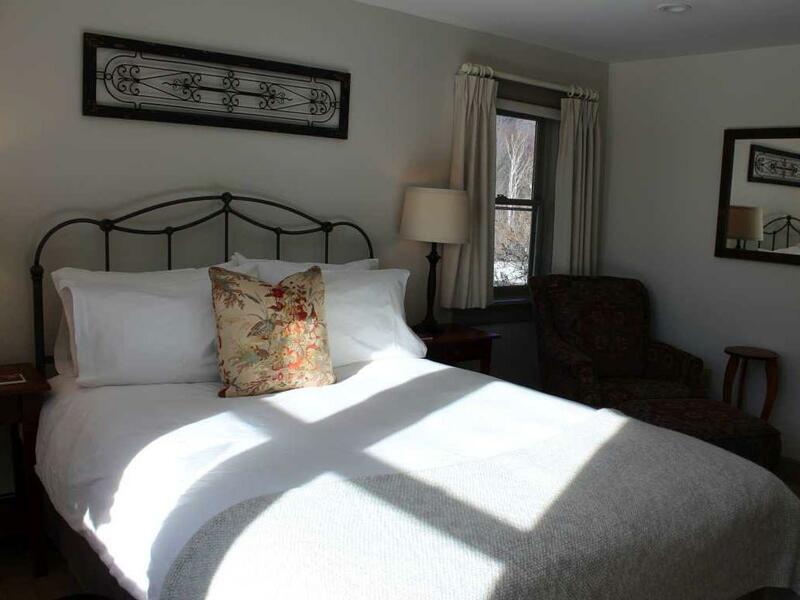 There are six well appointed rooms with "cloud beds" to give you the rest and relaxation you so well deserve. 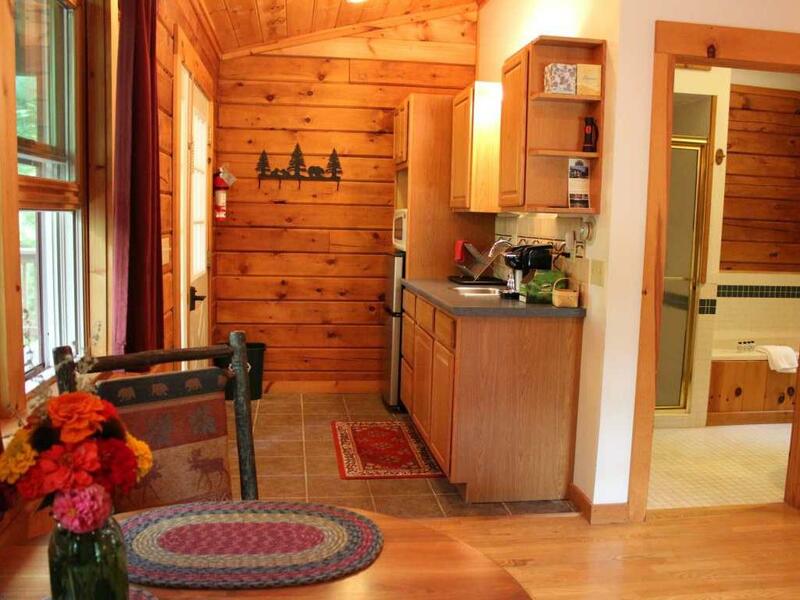 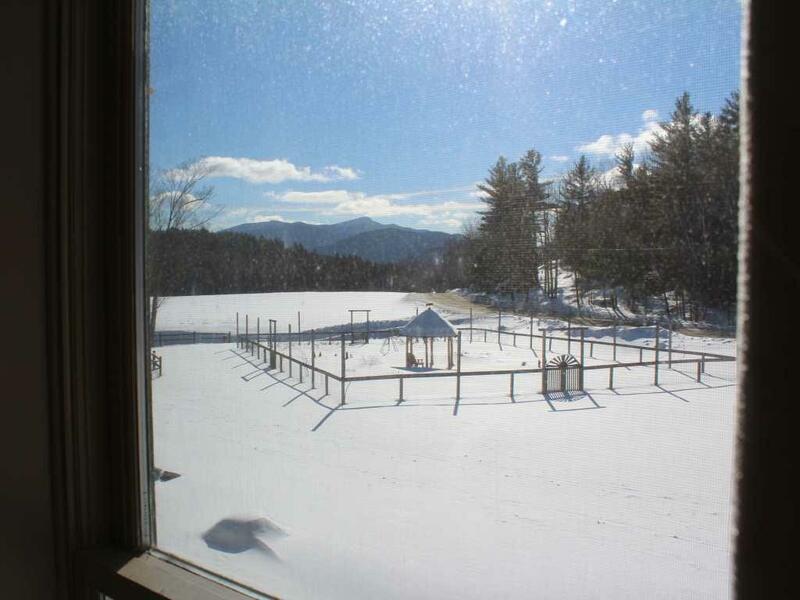 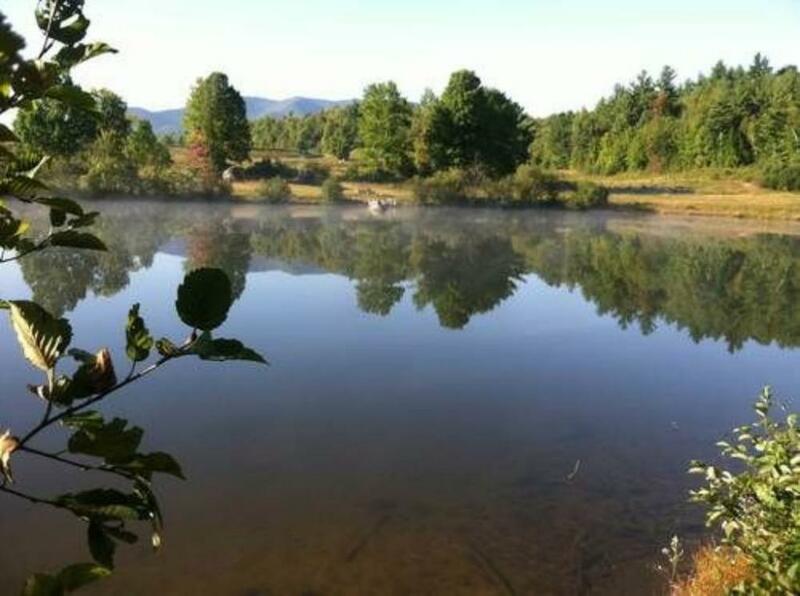 In addition to the Inn, we have 2 new cabin rentals. 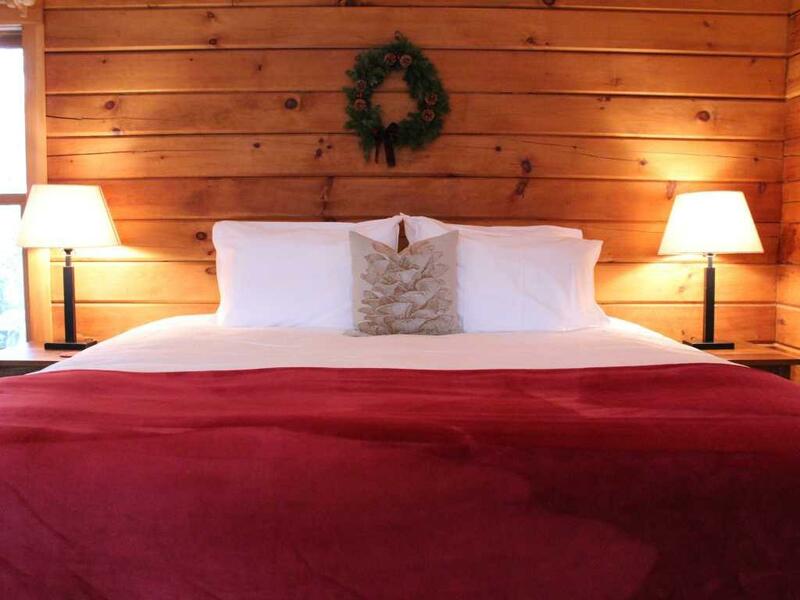 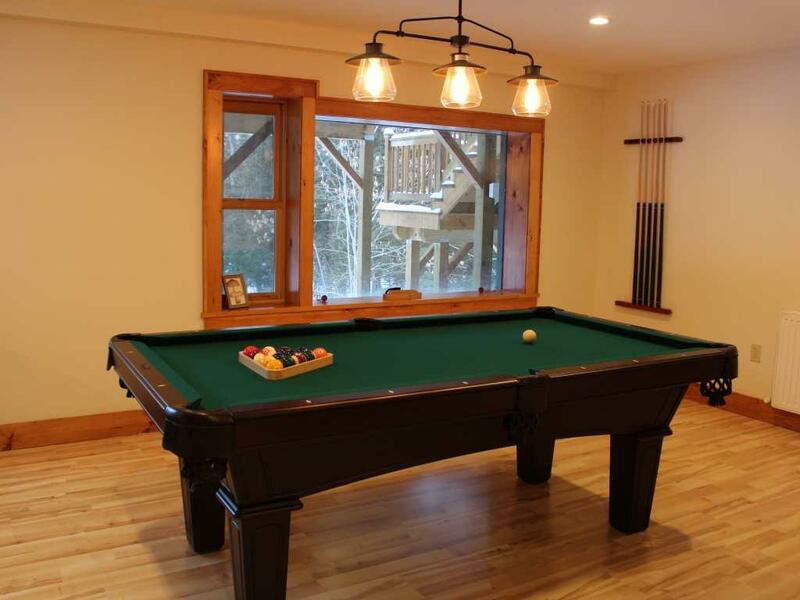 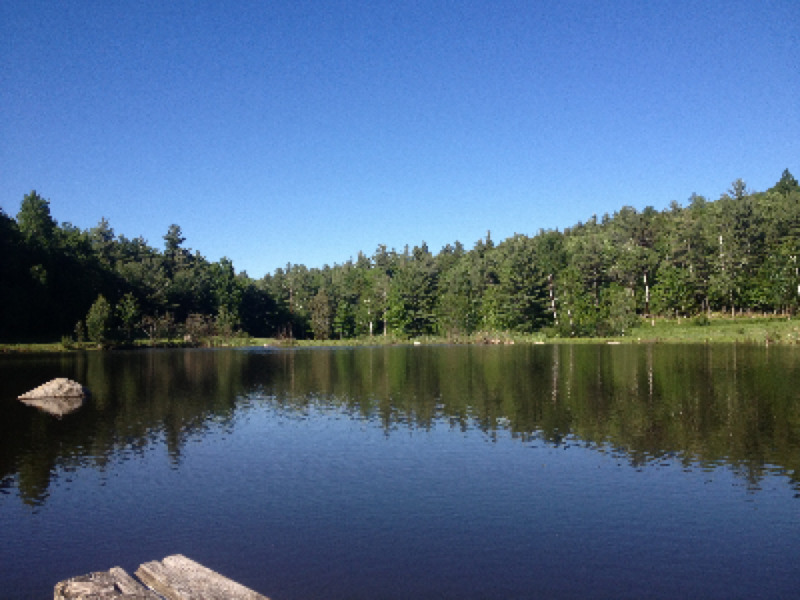 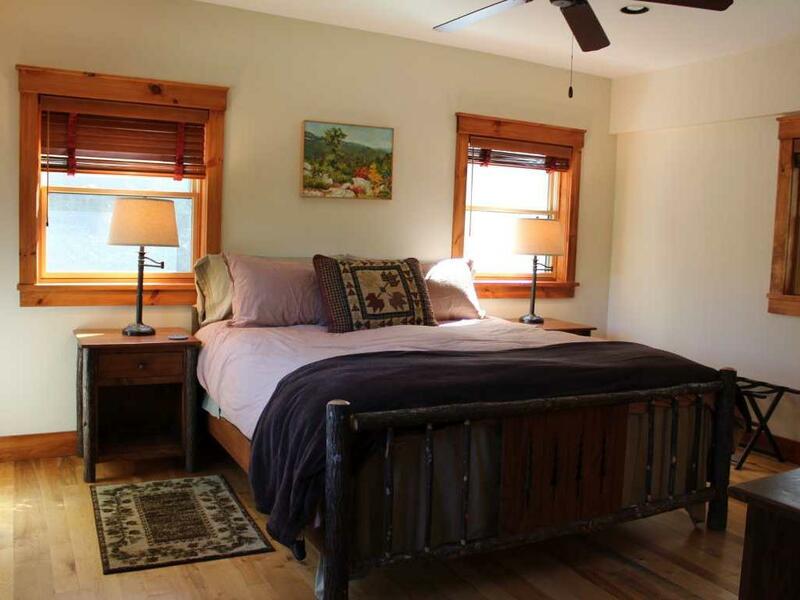 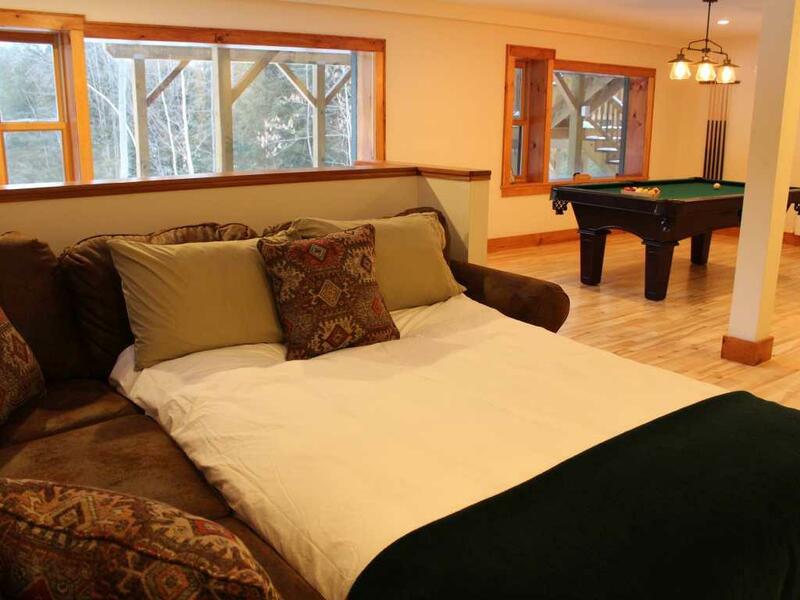 Trillium Cabin is our "honeymoon" style cabin with a king bed, jacuzzi tub, and kitchenette. 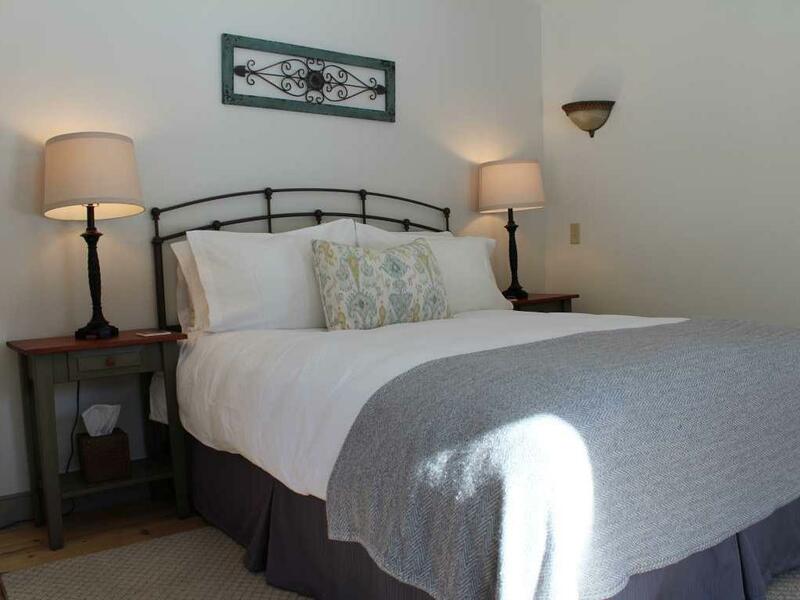 It's the perfect place for a retreat or romantic getaway. 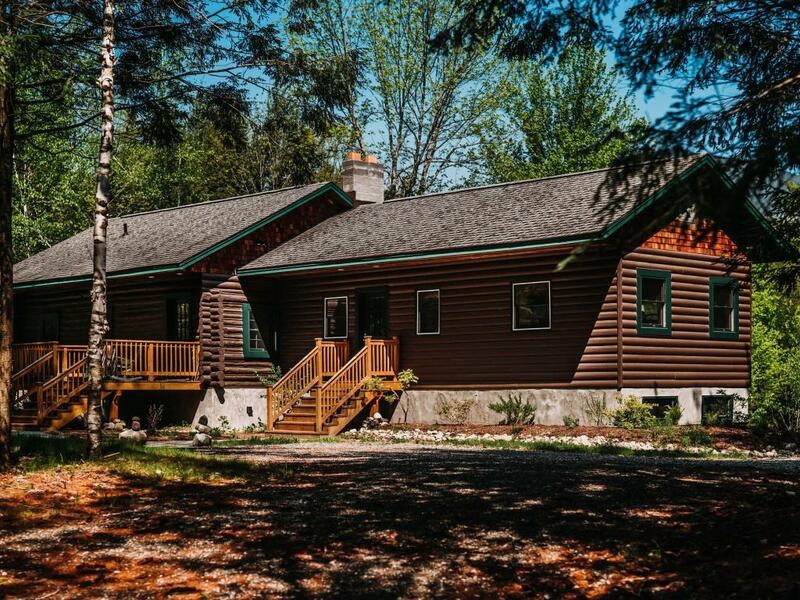 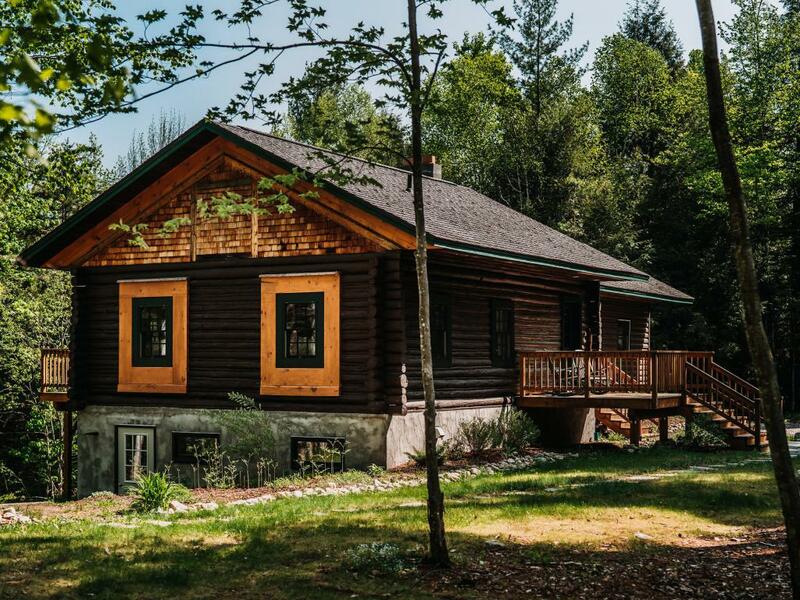 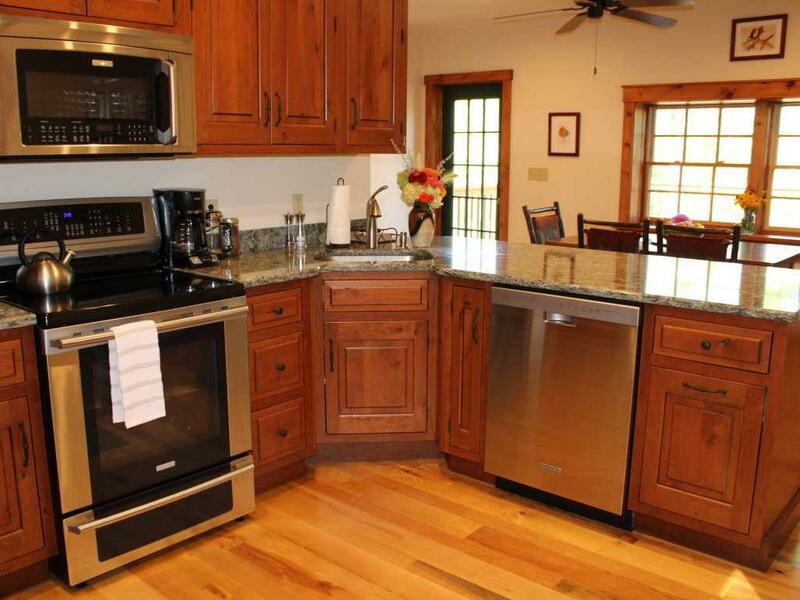 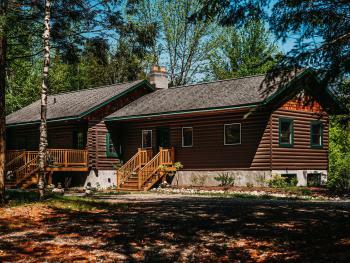 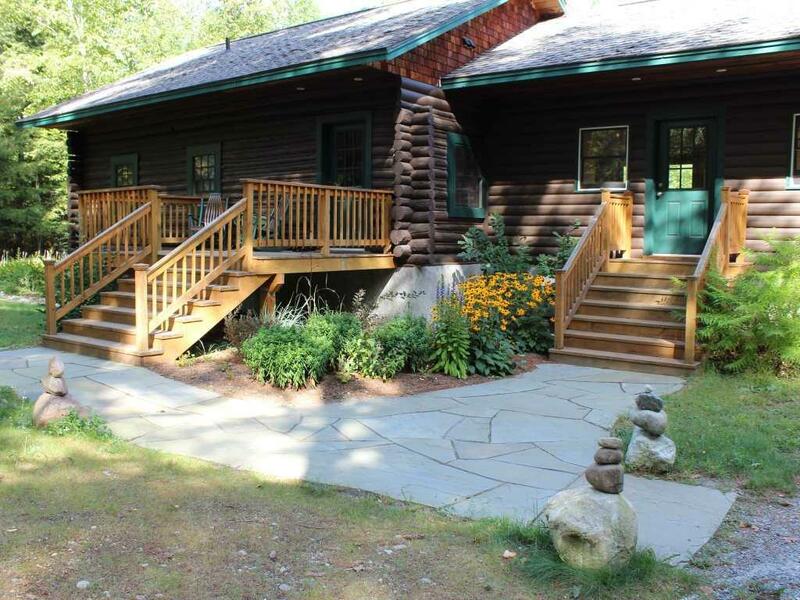 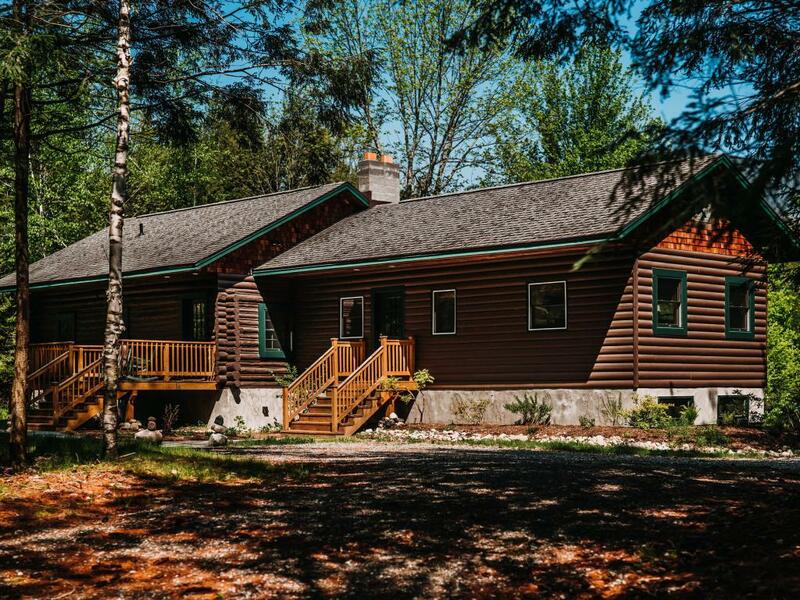 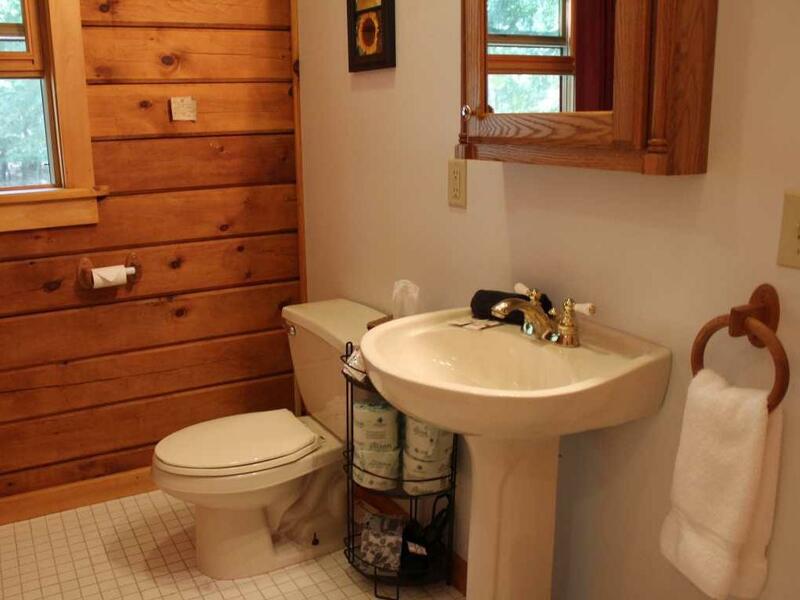 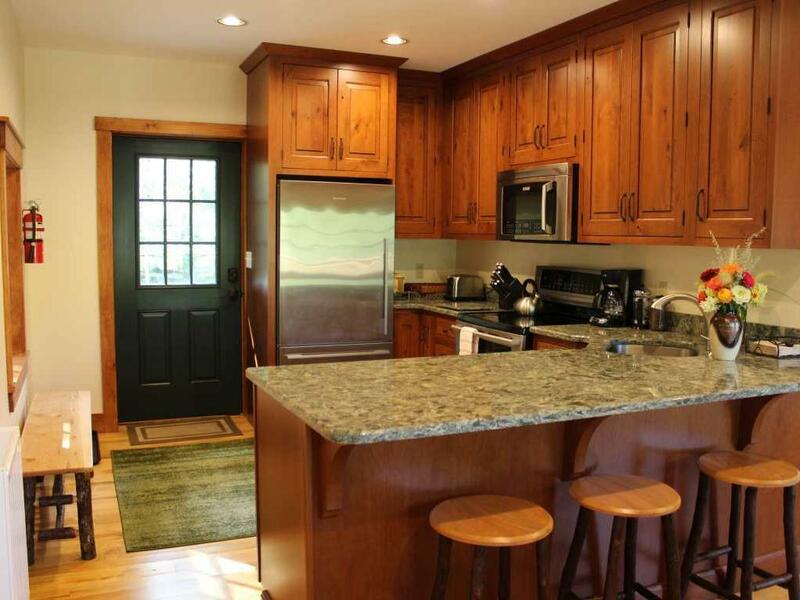 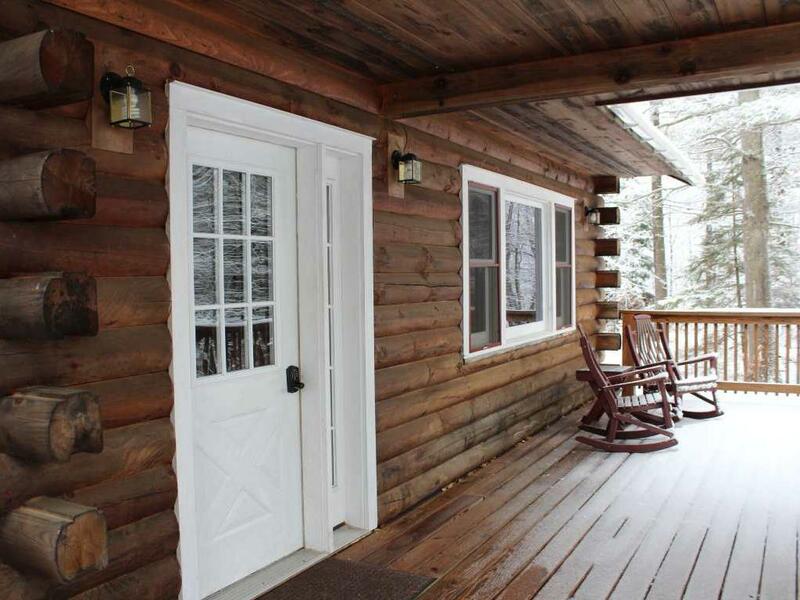 Sentinel Cabin is a 3 bedroom fully renovated log style cabin. It has 3 rooms with king or queen beds, a living room, full kitchen with brand new appliances, dining room, a lounge/game room, 3 bathrooms, 2 additional pull out couches, and a large deck with a grill. 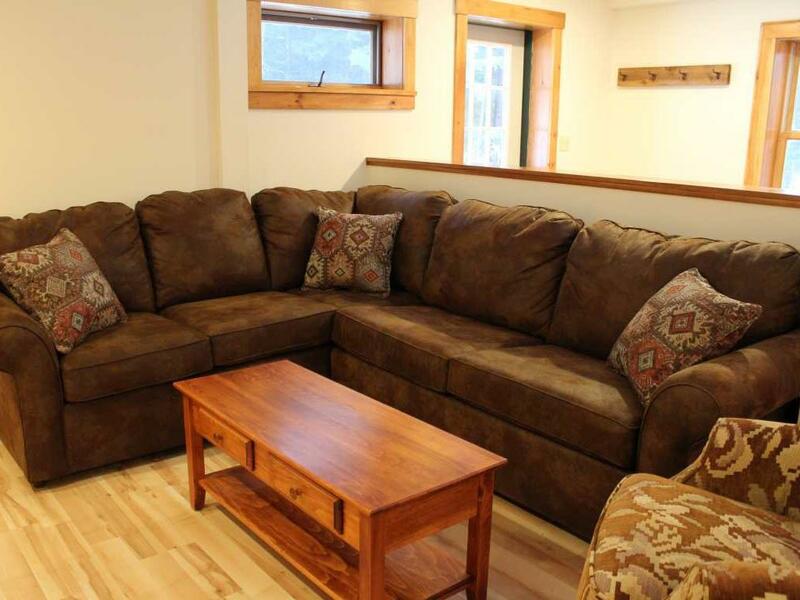 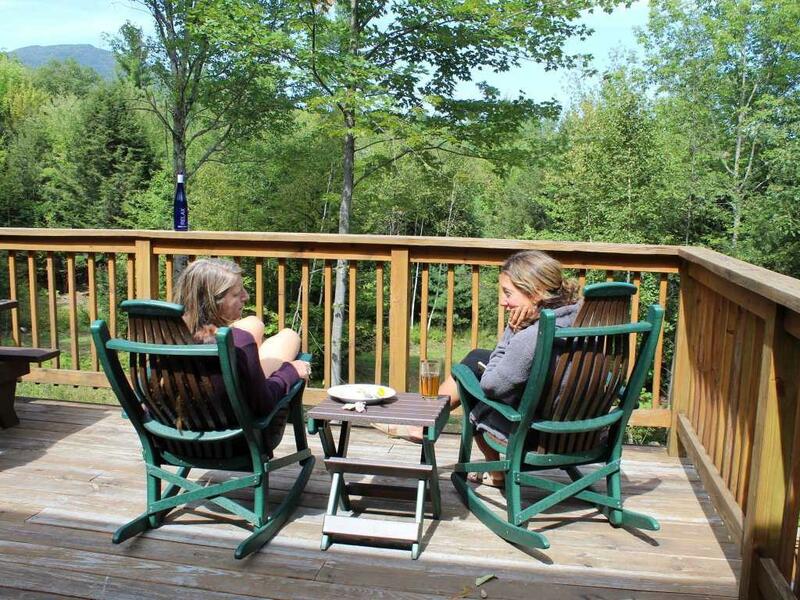 It's a great base camp for a family or group of friends. 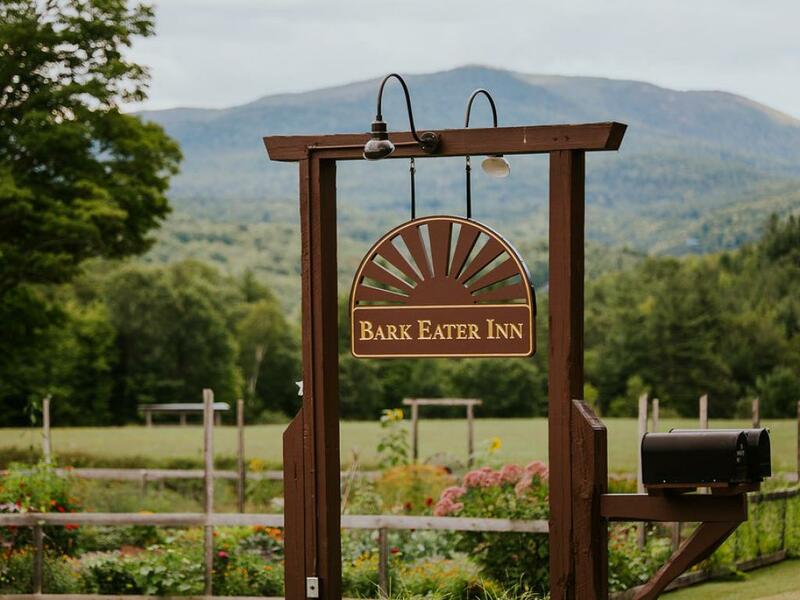 As of 2018 we began offering our location as a Wedding Venue and are now offering several outdoor spaces for wedding ceremonies and celebrations. 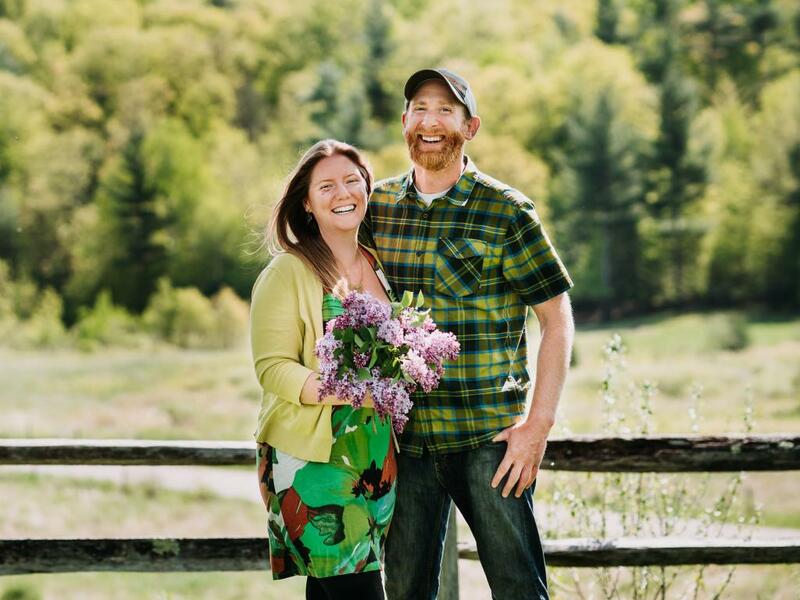 We are connected to a team of talented wedding professionals in the area and can help guide you to creating the mountain wedding of your dreams. 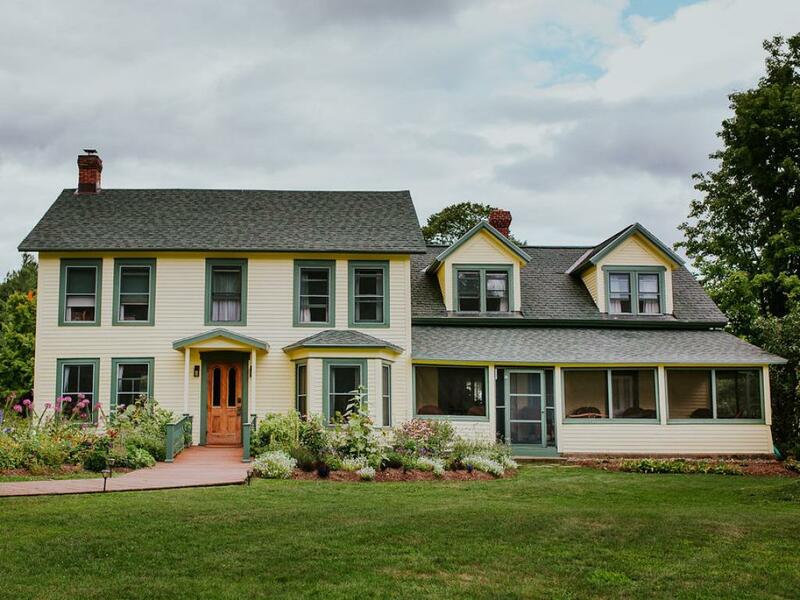 With epic mountain views, flowering meadows, gardens and a charming farmhouse, it's a gorgeous location for your special day. 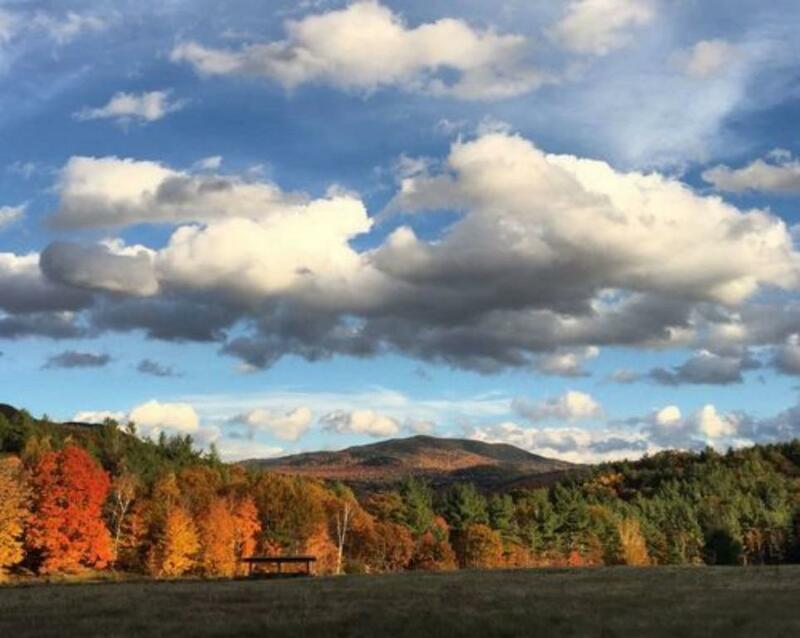 In addition to weddings, we also host group retreats, reunions, full house/property rentals, workshops, and more. 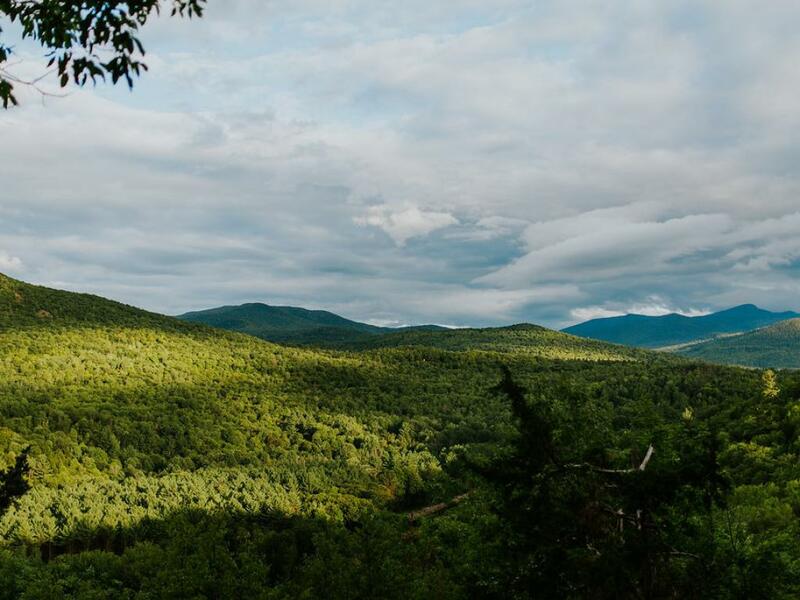 We have many exciting things up our sleeves that we look forward to offering in the future. 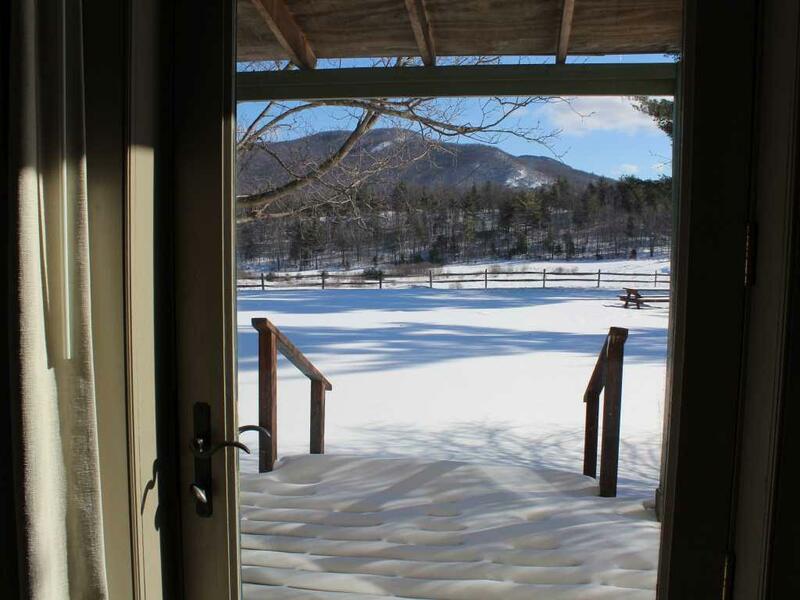 In the meantime we hope we have the opportunity to host you soon! 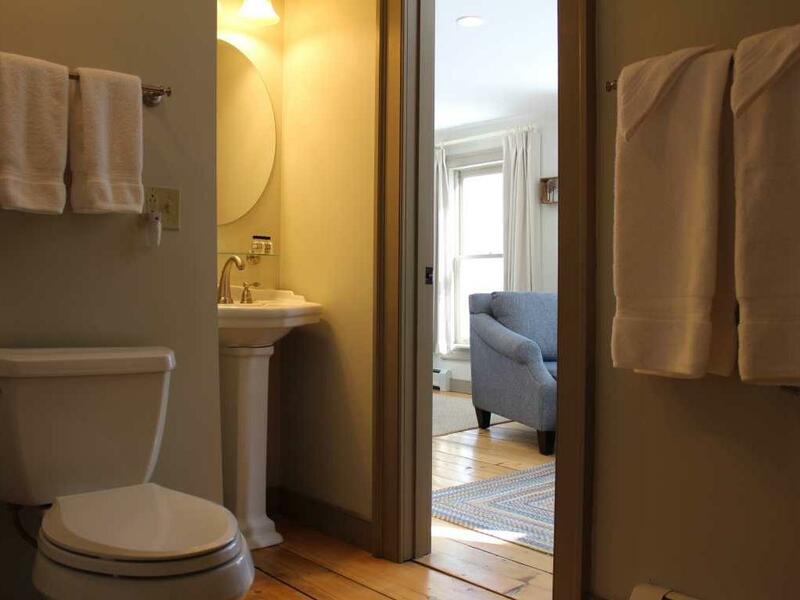 The entire ground floor of main Inn is wheel chair accessible including all common rooms, the public restroom, and our Maple Room. 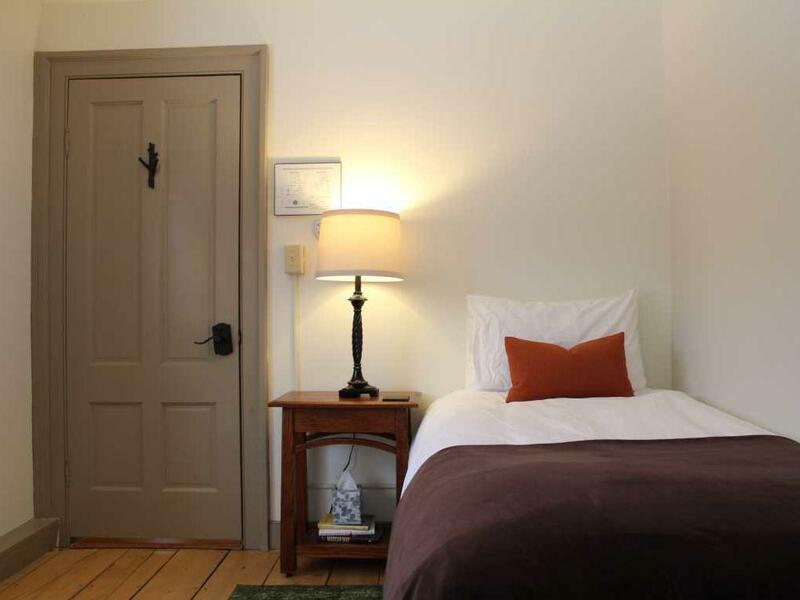 Maple room has wide doors and passes all ADA requirements for the room and bathroom. 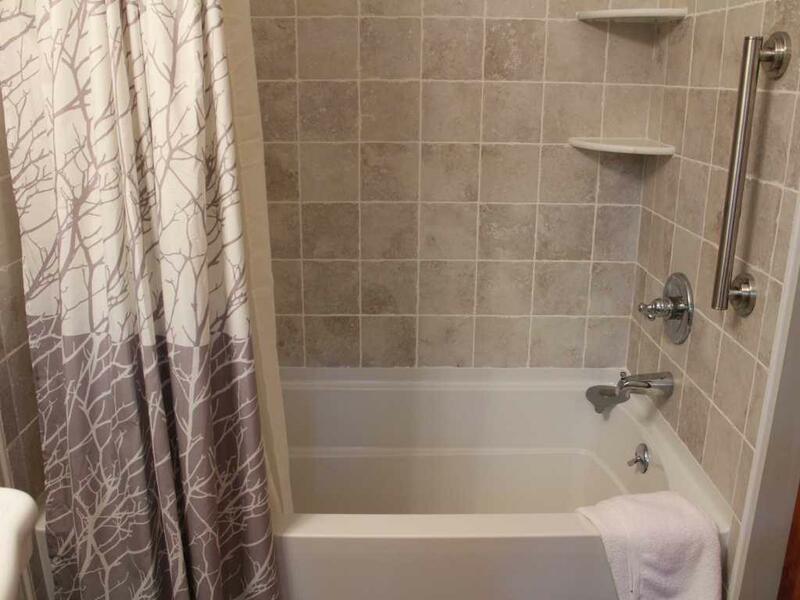 There are grab bars in the tub and around the toilet. 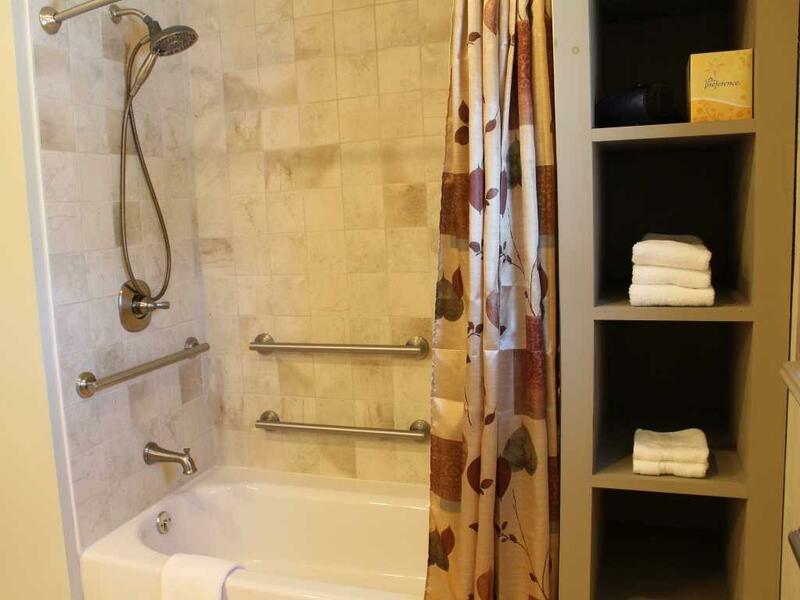 A shower chair is not provided.